In the early 1980's I was honored to have as a dear friend and work with the late Dr. Marcel Vogel who founded Psychic Research Inc. My name is Dan Willis. Although my background is in traditionally taught electronics and communications, I have always felt that the laws that govern these sciences have a profound basis that goes far beyond that which scientists can presently measure. 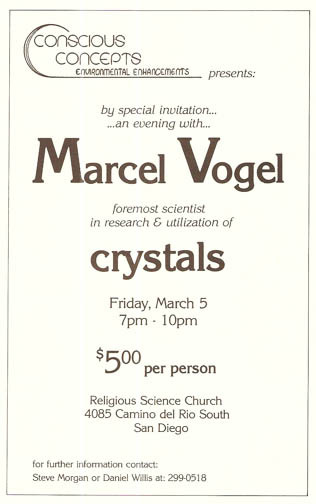 An unusual experience in my life that triggered my interest in sacred geometry is what lead me into seeking out the one person on the planet that was scientifically linking consciousness with geometrical forms as exemplified in crystals, Dr. Marcel Vogel. In 1983 he asked me to join him as a research associate. That it can be responded to by instrumentation connected to a plant or even conductive rubber. That it can be projected regardless of time and space, where the inverse square law does not apply. The inhaling and exhaling of breath is connected to the receiving and transmitting of thought information. Breath when exhaled through the nostrils in a rapid burst has the greatest degree of projecting thought. Quartz crystals can amplify, store and transfer these energies of thought. Quartz when geometrically faceted can cohere thought to a greater harmonic degree than when formed by natural forces in nature. Such as the Cabalistic male/female structure Marcel developed. Quartz SIO2 and Water H2O have similar tetrahedral and hexagonal geometries and resonate with the energies of mind similarly. All of the seven major crystallographic geometries found in nature can and have been exhibited in the formation of water showing that it can act as a fundamental matrix for forming all patterns in nature. When water is structured, it's state has changed to a liquid crystal which exhibits both the proprieties of a structured formation, similar to how ice crystals are formed, and that of a liquid. It only requires an extremely minute charge to structure water due to the polarity of the molecular configuration. When you seed a crystal it continues to replicate itself in it's own image. Similarly a small amount of liquid that is patterned will replicated itself in a larger volume of liquid to that seeded pattern. (1917 - 1991) was a research scientist for IBM’s San Jose facility for 27 years. He received over 100 patents for his inventions during this time. Among these was the magnetic coating for the 24 ” hard disc drive systems still in use. His areas of expertise were phosphor technology, liquid crystal systems, luminescence, and magnetics. You may read more about the life of Marcel from this PDF Document. 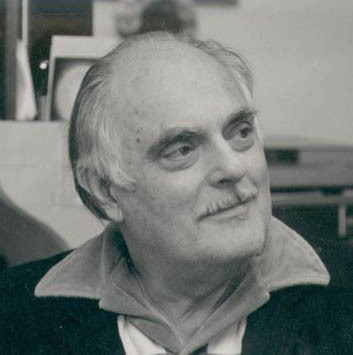 In 1969 Marcel Vogel gave a course in creativity for engineers at IBM. It was at this time that he read an article in Argosy magazine entitled “Do Plants Have Emotions?” about the work of polygraph expert Cleve Backster into the responsiveness of plants to human interaction. Despite initial rejection of the concept of human-plant communication, he decided to explore these strange claims. He was able to duplicate the Backster effect of using plants as transducers for bio-energetic fields that the human mind releases, demonstrating that plants respond to thought. 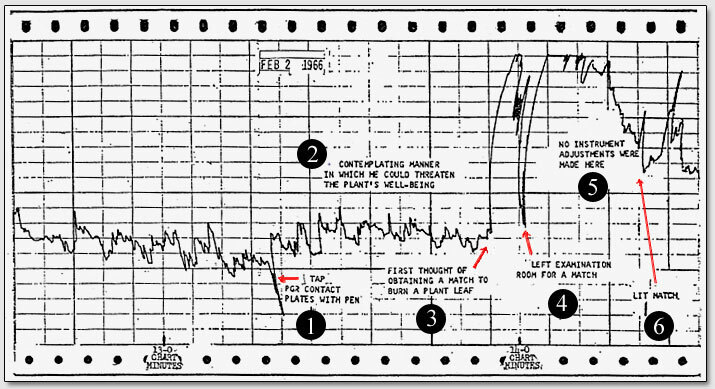 He used split leaf philodendrons connected to a Wheatstone Bridge that would compare a known resistance to an unknown resistance. He learned that when he released his breath slowly there was virtually no response from the plant. When he pulsed his breath through the nostrils, as he held a thought in mind, the plant would respond dramatically. It was also found that these fields, linked to the action of breath and thought, do not have a significant time domain to them. The responsiveness of the plants to thought was also the same whether eight inches away, eight feet, or eight thousand miles, as he proved from Prague, Czechoslovakia to his laboratory in San Jose where he was able to affect the plant hooked up to the recorder! Based on the results of the experiments the inverse square law does not apply to thought. Marcel said that squiggle on the script chart recorder changed his life. This was the beginning of Marcel’s transformation from being a purely rational scientist to becoming a mystical scientist. in 1974, he awoke from a dream with a pattern in his mind’s eye: the Tree of Life as shown in the Kabbalistic teachings. This was a teaching and a pattern with which Marcel was unfamiliar. At the time he saw only the pattern of a rectangle with a triangle at each termination. Various other shapes were also tried: single terminated, double terminated, four-sided, six-sided, six-sided with four-sided terminations, eight-sided with four-sided terminations and so on. From continual experimentation came the first fundamental instrument for storing, amplifying, transferring and cohering the energies of the bodymind of an individual: a four sided quartz crystal with pyramidal terminations. One tip was more acute than the other. The more acute termination is called the “firing tip” as this is the end of the crystal from which the coherent field is emitted. The faceted crystal was a three dimensional representation of the Tree of Life. The Tree of Life of the Kabbala, an ancient symbol of energetic flow from the universal to the personal that came to Marcel in a dream as a form to cut the crystal to transduce energy and focus thought. The upper triangle (female end) represents the Universal, which in the Tree of Life is what all is created from. The lower triangle represents the physical or personal manifestation which is where the focused energies of the individual are cohered and focused. (male end). The crystal is cut along the "C" or growth axis, the Universal or female end he cut to an angle of 52 degrees, the angle in which occurs naturally in quartz and exhibits the mathematical ratio of Phi (1.618) same as the Great Pyramid. 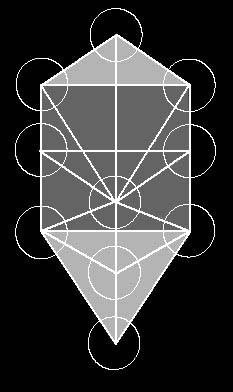 The crystal, like the Tree of Life of the Kabala, with the Universal or female at one end (at the top) attuned to the universal matrix we exist in and male or Personal angle shown at the bottom. The crystal is cut to resonate radionically to the rate of water which is 454. The crystal works much the same way that a laser does: It takes scattered rays of energy and makes the energy field so coherent and unidirectional that a tremendous force is generated - one that is much stronger than if the energies were allowed to be emitted without having come into coherence. The energetic healer has to deal with the emanations of his/her hands or bioenergy field, which do not have the same levels of coherence one can obtain by using a crystal as a focusing tool. The crystal, when used with Love, makes the energies of mind coherent. It brings these energies into a pattern exactly fitting the life force energies of the person seeking to be healed, then amplifies them for healing. The structural change in cutting quartz into the proper shape is to tune it to be a coherent information transfer device. The form geometry of such a crystal creates a coherent field of energy that can act as a carrier wave of information, whereas raw quartz does not. Why is this important? In the case of offering healing service to another individual, radiations emitted from the target material refers to the difficulty or distress experienced by the client. The coherent light emitted from the Vogel tuned crystal is able to penetrate the often disparate radiant fields within and around a distressed individual. An incoherent energy is often dissipated if not completely absorbed by the chaotic field generated by the distress. Beyond this the most profound effect of the faceted crystal has to do with its relationship and resonance to water. Because more than 70% of the physical body is water, the Vogel tuned crystal, with its resonance with water, is the perfect delivery mechanism for the introduction of subtle energies to an individual. Marcel also felt that the various subtle energy bodies described in metaphysical literature are gradations of a field that is anchored to the physical body via the water molecule. During the initial years of his work with crystals, Marcel developed a protocol for removing unwanted vibrations or thought forms from an individual in distress. He found that the crystal could act almost as an energetic scalpel in what amounted to an energetic or etheric surgery. 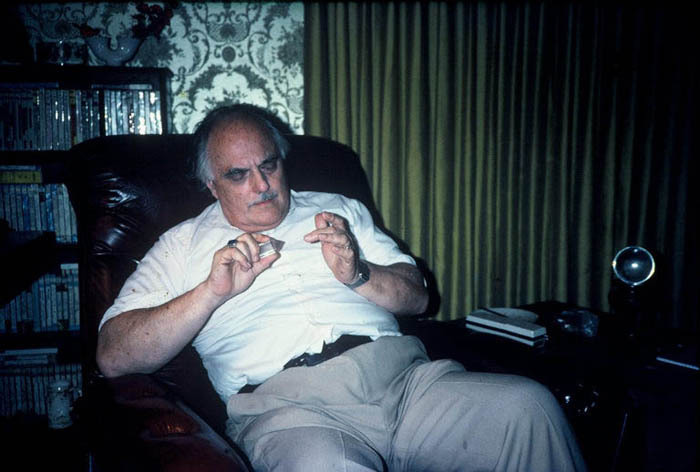 Over the years he developed various methods for proximate, remote, and self healing using the crystals. The crystal is a quantum converter that is able to transmit energy in a form that has discreet biological effects. This is most likely a resonant effect. The human body, on an energetic level, is an array of oscillating points that are layered and have a definite symmetry and structure. This crystallinity is apparent on both a subtle energetic or quantum level as well as the macro level. The bones, tissues, cells, and fluids of the body have a definite crystallinity about them. The structure of the fluids, cells, and tissues of the body tends to become unstructured or incoherent when dis-ease or distress is present. The physical body is comprised of liquid crystal systems in the cell membranes, intercellular fluids, as well as larger structures such as the fatty tissues, muscular and nervous systems, lymph, blood, and so on. Through the use of an appropriately tuned crystal to which these structures are responsive, balance and coherence can be restored by delivering the necessary “information” or energetic nutrients needed. 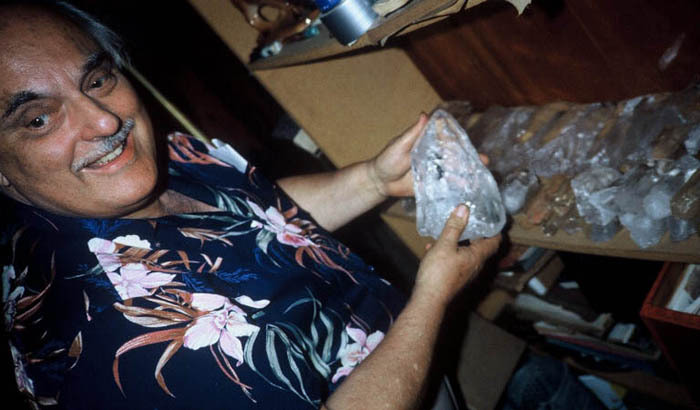 To obtain some of the first crystals to be used in this research work, so that the quartz could be cut in the above shape for experiments, I drove from San Diego to the mines in Arkansas and carefully hand selected the first large batch of quartz crystals for Marcel. These were cut and faceted for approximately two dozen medical doctors in the San Francisco Bay area. This group of doctors he used as an experimental base for research for the application of his technique of releasing discordant energy patterns in patients bodies that manifested as physical aliments. These ailments were treated through the intervention of focused thought with breath amplified by utilizing these quartz crystals that were uniquely cut to the resonant geometrical angle frequency of each doctor. 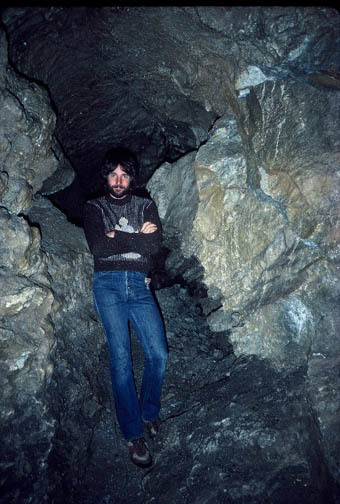 Below is a 1984 photo of myself at the crystal mines in Arkansas, on a mission for the lab. Marcel was delighted with the quality of the quartz delivered and sent me a special letter of appreciation saying that I had done "a great service for the good of mankind" and for the beginning research for the lab. It was an honor to assist him in this pioneering work. 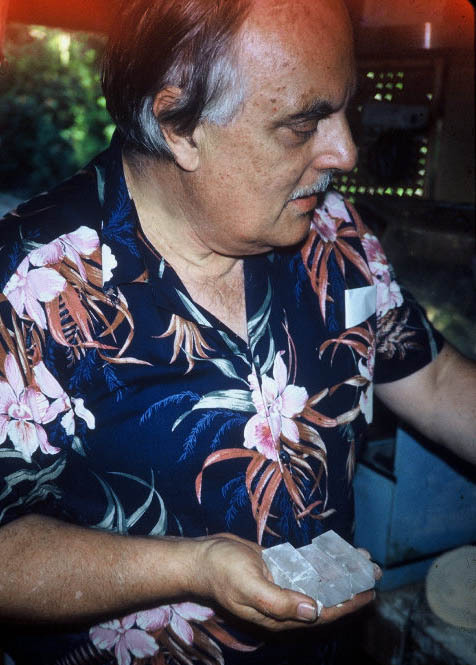 Using a lapidary setup at his home before the PRI lab was created, Marcel makes the first rough cuts as shown below, before polishing. Shown here is the Omega-5 unit using a sample witness from an individual, the 9 dials are turned to find the resonant number of the witness sample and as they are turned, the surface tension of the stick pad changes and starts to stick when rubbed with the fingers as an indicator of resonance. 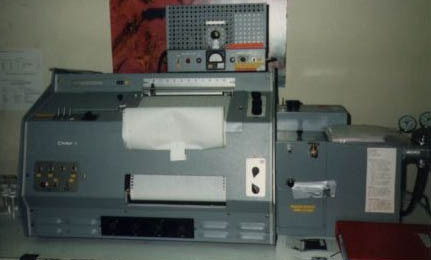 Although a subjective type of instrument, the Omega 5 produced data that could be used to indicate how to proceed in the use of standard scientific measurement. Sometimes information isn’t discovered because one simply doesn’t know where to look. The Omega could give clues as to where to look. I will always treasure the crystal that Marcel specifically cut and gave me as a gift. It was one of the very first crystals he cut from the crystals I delivered from the mines. I do not consider myself a healer or anything along those lines, although my family line seems to be filled with doctors and mystics. I am primarily interested in the science of the fundamental operating principles of these newfound sciences. The day after I received this crystal from Marcel, I boarded a flight home and sitting next to me was a football player who just finished having surgery on his knee, which he was holding in pain. This appeared to be one of those situations where you are given a gift and then given the opportunity to use it. I introduced myself to the fellow and said, "look I am not a doctor, rather an experimental scientist," and that if he would like, I could utilize some rather unconventional techniques that could prove effective in relieving the pain in his knee. I used the techniques that Marcel taught me and when he got off the plane and met his parents, he pointed to me and said "That guy, he fixed my knee, and it doesn't hurt anymore". I was equally surprised as he was and grateful the techniques helped him. After that experience I used the crystal that Marcel gave me on over 200 individuals from broken fingers to tumors and experienced a success rate of 90%. I haven't used the crystal for many years now, except when a situation seems to present itself. Of course as the crystal was a gift, I never associated money with it as it was a tool to learn knowledge and that the techniques were effective and the fundamentals that were at work proved themselves to me. I was merely facilitating the individual's creative use of energy. After all, as Marcel would say, "Man is created in the image and likeness of God, therefore we create". And so it appears that we do recreate ourselves every instant with every thought and breath we take. Since the early work with the original 4 sided healing crystal, Marcel went onto experimenting with greater number of sides which he believed affected the frequency of spin through the crystal as the number of sides increased so did the frequency of the spinning vortex within the crystal. I was told he believed the 8 sided to be his "work horse" and that the different number of sides related to the various energy bodies i.e. 4 = physical body 6 = emotional 8 = mental etc. Not any lapidarist can cut correctly a Vogel crystal as the angles are cut to the individual and then the way the light reflects within these facets is key to cohering thought within it's form. In 2009 I had Gil Riegler one of Marcel's original cutters cut from some exceptional Brazilian material which came from a US acquisition back in the 1940's, an 8 and 16 sided healing crystals. Gil is highly skilled in this art and does exceptional work as you can see below. I took this photo of Marcel in his favorite chair at home in San Jose. Marcel could rotate the crystal to what he called "The Critical Rotational Angle", which is the angle in which the crystal becomes resonant with the body you are attuning to. Resonance is indicated by a sharp rise in energy sensed by the hand and which Marcel said he could measure on an electrostatic voltmeter. The quartz crystal sphere which Marcel is holding is one I lent him for his experimentation. I still have the sphere and I believe what he said is true "Records are written in stone" for I can still sense his presence with the sphere. 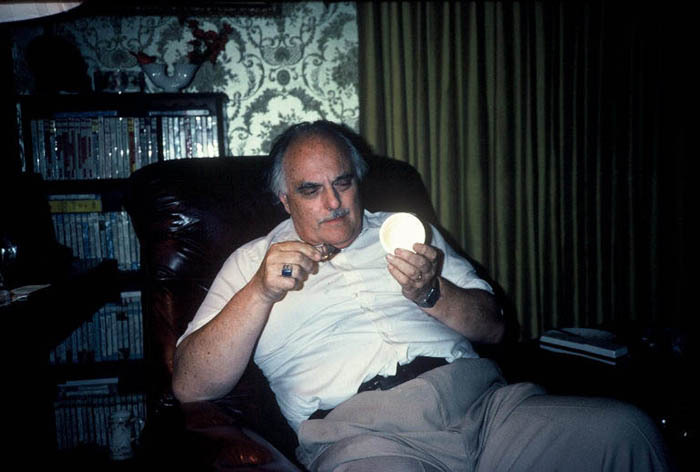 It appears in the photo that the camera's flash happened to catch the correct angle to light up the sphere as it did, but with Marcel, you never knew if it was only the light of the flash, as he was focusing energy into the sphere. 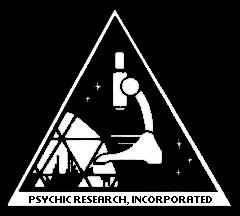 In 1984 Marcel retired from IBM and formed Psychic Research Incorporated and opened up the lab.. 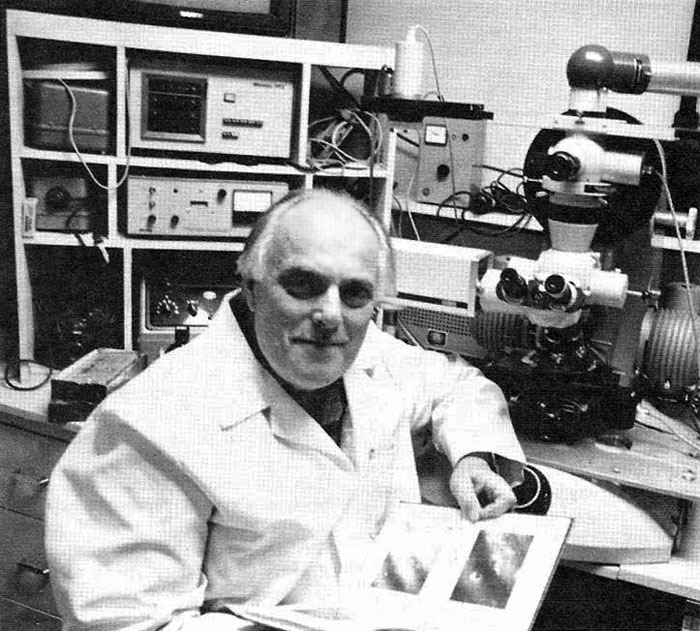 The Zeiss Ultraphot microscope that Marcel was given as a retirement present from IBM which he assembled himself at the lab. Marcel said that by changing filters of InfraRed and UltraViolet wavelengths that different structures operating at different frequencies would appear visible that would not normally to the human eye. This Spectrophotometer I was able to acquire for the laboratory from a military electronics surplus in San Diego. 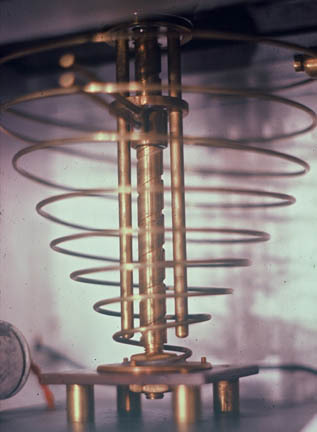 This instrument was valuable in measuring the valence bands in water that were altered creating a new set of bands around 3000 to 4000 angstroms after thought was pulsed into the test water sample, showing the effect of the energy being altered in the structure of the water by thought. One of the projects I worked on with Marcel was a Inter-dimensional Imaging Device called the DeLaWarr Camera, which was imported from England to the lab. This device stood over 5 feet tall and the internal workings were beautifully machined out of brass. 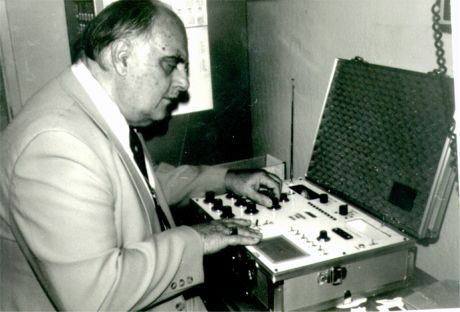 My background with radionics started a long time ago when I first completely reverse engineered a radionic device that was written about in Fate magazine. The exact device the article had written about, I had for a short time in my possession. The article said, that it could take a photograph of a field that was being destroyed by insects and selectively broadcast an insecticide to a polaroid photo of the field which was cut in half. The results claimed that the half of the infested field, which the device broadcast to, had affected the insects and they were dying, while the other half of the photographed field, that the device was not attuned to, was unaffected. Those who understand the mechanisms of consciousness through a radionic type device, know that, what you do to others, you do to yourself. If your intent is to hurt someone or even kill bugs as spoke of in the first device I studied, that vibration you take into your own personal consciousness matrix. As Indian Chief Seattle put it well "Humankind has not woven the web of life, we are but one thread within it. Whatever we do to the web, we do to ourselves. All things are bound together. All things connect. So the latest evidence in quantum physics shows all things are "entangled" and indeed connect to each other. Discovering that the instrument was nothing more than a 2 stage vacuum tube amplifier, with it's input connected to the witness well and the output to an extended antenna, I became suspicious that something more was at work here. Consequently, I have built a Hieronymus type of radionic instrument using a tunable quartz prism, then a Bruce Copen design of 9 dial instruments, and even a gem therapy radionic instrument as well as other types of radionic type equipment. What I have found is that in essence the radionic instrument is nothing in itself, but merely a tuning focus for the mind, and that everything hinges around intent and that just about anything can be created into a radionic instrument. As Ruth Drown once stated, "Everything in the universe is here now, all we have to do is tune into it". A radionic instrument merely provides a method of ratio tuning the holographically-based universe by taking a witness, such as a photograph or drop of blood from a person and using a feedback mechanism such as a pendulum or membrane pad that is rubbed called a stick pad. Then the person's resonant frequency or sometimes called personal rate in radionics, is attuned to. In the matrix of consciousness, which we all share, everyone does this everyday whenever you think of someone you are attuning to them. Using a radionic instrument to attune with a feedback element, you could say, coheres the thought form into resonance in the radionic device. Then you can take your thought focus and go elsewhere once you have crystallized, you could say, your thoughts into the device, which will continue to broadcast or radiate to the witness. The dials can be set to different degrees of rotations, these rotations of 0-9 give the reference numbers that are called radionic "rates" . These rates, various individuals have categorized, such as Abrams, Copen, Drown, DeLaWarr etc. But these individually created instruments have their own "agreed upon reality" from their creators for the various rate numbers. Therefore, anyone can make anything, but not everyone can make any of these instruments work. It is a faculty which everyone has, but it appears some individuals can use this ability better than others. Also it should be noted that those who have the most effective devices are those in which the individual has created from their own inspiration of design. Never-the-less, the common denominator of all this, is that even though the designs and the rates differ, they all seem to be able to give a validity to the concept that time and space is contained within the holographically-based universe and that a witness (drop of blood, hair, signature, photograph etc.) is a microcosmic holographic link to it's macrocosmic whole. In regards to radionic instruments ability to lock-in or cohere a thought pattern. DeLaWarr was reported that he once did an experiment with tuning the instrument to the rate or frequency of the metal lead with a small amount of the lead material as the target. The amount of lead was weighed beforehand, and after several hours was weighed again and it was noted that it had gained in mass slightly. This could be an indication that thought, once cohered, can start to take physical form. The purpose on this project with Marcel was to understand the principles at work within the camera that was created in 1955 and to incorporate the current technology of 1983 to reproduce the images which could attune to an individual through the use of a witness. 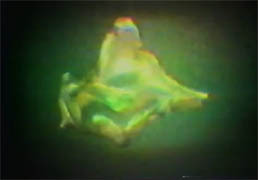 A witness with the camera, such as a drop of blood, represents a holographic connection to the individual anywhere throughout the holographic nature of the matrix of creatiion, regardless of time and space. Through the geometrical alignment of the radionic tuning to a specific aspect of the individual, with the additional parameter of the element of time, using the time spiral, an image could be captured in the silver emulsion of film regardless of time and space. The theories of a holographically-based universe were originally championed by two of the world’s most eminent thinkers: physicist David Bohm, a protégé of Einstein’s, and Karl Pribram, a highly-respected neurophysiologist from Stanford University. Their holographic model received dramatic experimental support in 1982 when a research team led by physicist Alain Aspect in Paris demonstrated that the web of subatomic particles that compose our physical universe, possesses what appears to be an undeniable “holographic” property. Although science in the future may look back at these archaic interdimensional holographic matrix attuned image recorders and put them in a place of merit in a museum of science history. This science project I worked on in the early 1980's with Marcel was more like an episode in the Outer Limits than what is currently acceptable science. 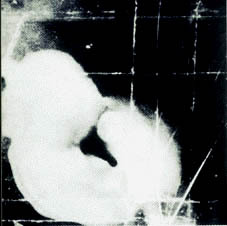 The Radionic Camera developed in 1955 by George DeLaWarr was capable of imaging the past and the future, and he published thousands of photographs demonstrating the effect. "Time is a vector of the magnetic spectrum and that spectrum has a place in itself for events... 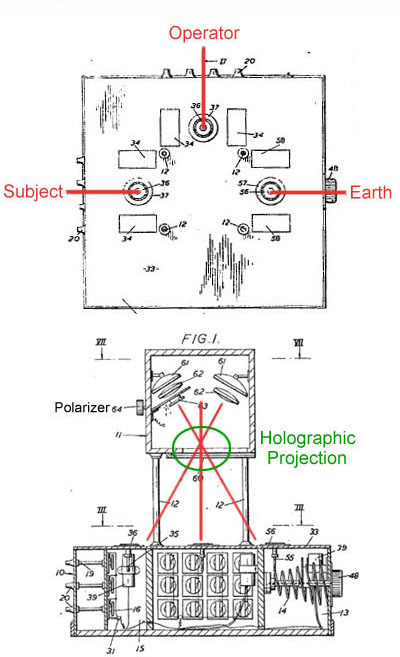 There is a pre-physical world in which the camera might be expected to operate"
Indeed, the camera imaging was projecting in space modulated the holographic information of the subject witness onto an a tuned through angular alignment magnetic field which modulated the audio sound oscillators as a carrier wave into a 3D holographic projection of a pre-physical field in which the flat plate of film was only able to capture a cross sectional portion of the full 3D pattern projected in space that was reflected back onto the photographic plate. The principles are in some ways "akin" (as Marcel always used to say). 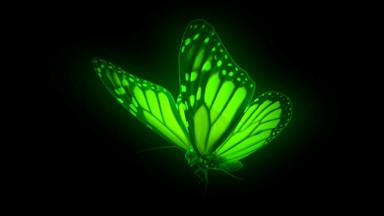 In laser holography, you make a hologram by reflecting a laser beam off the object you want to create a hologram of. You split the laser beam into two separate halves by shining it through a half-mirror (a piece of glass coated with a thin layer of silver so half the laser light is reflected and half passes through—sometimes called a semi-silvered mirror). 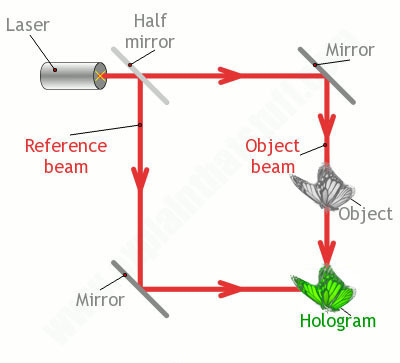 One half of the beam bounces off a mirror, hits the object, and reflects onto the photographic plate inside which the hologram will be created. This is called the object beam. The other half of the beam bounces off another mirror and hits the same photographic plate. This is called the reference beam. A hologram forms where the two beams meet. The reason this occurs is because the reference beam is purely coherent (meaning it resonates on an exact frequency of light) while the reference beam reflecting off of the object causes an out of phase relationship between the two converging beams. This phase difference between the beams creates in space what is called standing waves. 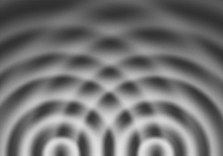 These standing waves create points in space where the information difference between the two light beams recreates the object in 3D at the converging point in space. Illustration showing how the converging "reference" and "object" laser beams recombine to create a hologram. The DeLaWarr camera has essentially the convergence of attuned energetic patterns that recombine at the photographic plate area in order to capture a portion of this pre-physical 3D energetic field that is projected in space by the camera. Similar to how is laser holography where the object beam is in a varying different phase relationship than the reference beam in order to create the standing wave patterns in space that represent holographically the object. The DeLaWarr camera creates an out of phase relationship through the use of a polarizer which causes a phase shift to allow the standing wave patterns, also known as interference patterns, that recreate holographically the attuned aspect of the subject using the witness as the fractal representation of the subject anywhere in the universe. As each of us is a fractal representation of one great divine mind, and as in a hologram, in every part is reflected the whole, and the whole is reflected in every part. Any changes is a hologram is therefore reflected in all aspects of the hologram. This holographic nature of the universe is also reflected fractally in each of us and all things within the universe into infinity. This is why mankind using linear accelerators such as at CERN can never find the smallest particle. The 7 turn Time Spiral is unique on this radionic device in the ability to move forwards and backwards through time. Science is beginning to see that gravity, time and space are all interrelated and that the past and future exist simultaneously in the present operating at different frequencies. As we move through time, all is being recorded, these recordings in time appear to have an association with a particular aspect within a magnetic field. George DeLaWarr was able to photograph back in time 30 years to his wedding day through the use of aligning the magnetic field along the use of this time spiral implemented into the design of this device. Marcel frequently stated that "We are made in the image and likeness of God, therefore we create". Each of us are creators in this participatory universe because we are a fractal of a great creative mind. The research has show that the physical world we experience is actually very similar to a hologram that is emanating from a higher frequency pre-physical pattern. This has been shown in many experiments that when a change occurs for example in our physical body, that that change first occurs in the higher formative frequencies that are a precursor to the physical form, and that when change is affected at that higher level (i.e. healing with a crystal etc.) the physical form which is the resultant of this higher formative pattern which originates from our soul, is immediately transformed. On this project, I worked with Marcel and two other research associates and in my study of the blue prints, I found that the resonant wooden cavity was based on a 1.618 or golden mean ratio. I was with Marcel when he charged the plates and took the first images on the camera since it was last produced images occurred in 1971 in England by the Radiionics Association. The image we produced appeared to look like an X-Ray diffraction pattern, but imagery exactly like DeLaWarr was able to produce, we were not able to. Briefly, the procedure in using the instrument was to align it with magnetic north and then the blood spot or witness placed on the witness plate, then a magnet between the plates was to be rotated until resonant. The 9 dials were tuned to the specific rate of what was to be photographed and the 7 turn Time Spiral tuned to the earth's resonant frequency or the proper time band. 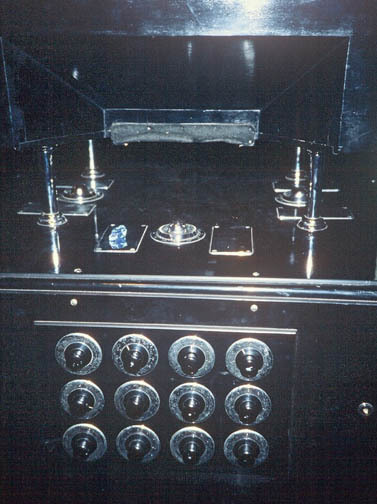 The switch was thrown and the audio oscillators inside the unit vibrated the cavity (Here you could associate the element of sound with matter coming into manesfestion) The energy from the 3 sections then went up into the upper housing which had 3 sets of reflectors and lenses that focused the energy back reflecting onto the photographic plate to record the image. Below is a sample image that DeLaWarr took, one of over 10,000 that he photographed with the camera. The above original DelaWarr photograph was taken at the request of a distant patient who wished to determine her precise stage of pregnancy. The photograph reflected the fetal development between 8 and 12 weeks gestation (later confirmed by delivery date). 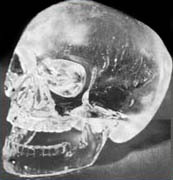 A significant amount of skeletal structure can be seen in this image. The radionic dials are tuned to resonance through the principle that everything is enfolded into everything, and that any aspect of the whole can be attuned to as a divisional ratio of that whole. The unique element of the DelaWarr Camera from other radionic devices is the incorporation of a Time Spiral of 7 turns in which the witness once attuned to could resonate at a different place in time to take a photograph in the past or in the future. 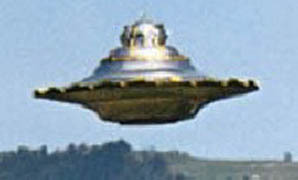 Once the witness was attuned to and amplified using the magnetic rotational dial and the sound resonators oscillating. The dials would be rotated and attuned to the aspect of the witness to photograph. If a time element of that aspect wanted to be photographed then the Time Spiral would be attuned to. These subtle oscillations would be projected upward in 3 axes into the separate compartment above which held the photographic plate. Above the plate 3 assemblies of lens and reflectors focused the energy back onto the photographic plate in which the silver emulsion on the film responded to and captured the image. We now proceed with the first paper for 1983 we're delighted to have with us a gentleman of attainment Marcel Vogel senior scientist at IBM for 26 years who specializes in material science in magnetic coding for magnetic disks those of you who are using computers and have been using them for years the magnetic disks come from Marcel Vogel's work he works on rare earth phosphors liquid crystal systems study of the energies of mind and the utilization of those energies in healing and psychotherapeutic devices ladies and gentlemen it's my pleasure to present Marcel Vogel. Thank you very much ladies and gentlemen and friends it is good to be here and to share with you for the first time the information that has been accumulated by us on the Delaware camera this has been one of the great mysteries of the radionic association it has been accumulated with story after story of all sorts of weird things and today this morning I will try to give you the most concise factual information that I possibly can on what we know at this moment in time on the camera the camera is a remarkable work of one of our brilliant people who have worked in this field of radionics George Delaware, Marjorie Delaware, Corte and his associates and I dedicate lovingly this lecture to them and the pioneering work they have done in the discovery of new particles that we have in space that are capable of being recorded by this camera it is not only a system for recording a picture but it reveals that we are you and I high energy generators of fields we generate these fields propagate them in space and with very simple devices can record them on film or plate and they are equivalent to what we see in the linear accelerator where millions and millions of dollars are spent to capture these tracks that they study in the bubble chamber how can this be? This is the mystery and this is what I wish to share with you in the time that we have together, the realization that we are here on a forefront of new science the science of mind the science of spirit and above all the science of the soul. That which brings man into the image and likeness of a divine mind or God. Working with these instruments, I come to total realization of the divine supreme mind that exists everywhere, I come to the realization that we are one, that there is only a mind mutti of differentiation in this physical form which we call matter, but when we step up the vibration then that matter takes on this divine aspect and radiates that perfection of the one mind and that is what you can see in this camera, provided you set the rates and the dials correctly. Number one we set up a vibrating audio carrier wave we set up a note or tone which beats in harmony or in synchronization to the fundamental note of the earth frequency and our note what you generate in the radionics rates that you determine with the turning of the dials is your note what you determine is the oscillating vibration of matter consolidated into form because when matter is brought into form it oscillates it manifests its form by a vibration when you interfere what that vibration matter does not exist you can disintegrate matter by just interfering with its form a minut interference with the form aspects of the matter separates and no longer is. Now we must do three things it's a triple hologram what is in the camera. Third, you set the vibration of an object that you wish to investigate or look at. And in so doing that it injects its carrier wave on a noise spectrum white noise now the remarkable discovery of George DeLaWarr was that sound can be transported by a magnetic field sound can be directed and consolidated or burst through a magnetic field a bar magnet the basic discovery of George Delaware was finding that he can tune these vibrations and focus them in space with a magnetic rod and in so doing bring a burst of energy which is no longer sound but a preform of matter it is the precursor towards that which we call the material world so he then can bring into being through the transposition through a bar magnet of sound a formation of a preform of matter that then can be reflected with parabolic reflectors focused with lenses onto a sensitive plate now you deal with only one aspect of what I am saying and you will only get a stripped version incapable of understanding when you look at the plate when you deal with all three aspects you have a multi-dimensional hologram which now with a flat plate I am seeing but a fragment I will be working when I return with stacked plates plates set at many multiple angles but above all liquid crystal systems which will give me the chance to see the multi-dimensional aspects of what we are talking about. Because of the time constraint given to me in the first part of this lecture I'm consolidating matter and bringing it into a tighter time schedule we must do this unfortunately at all times so I'm trying to create first for you a mental picture of what takes place and then you will see it on videotape and you will see the actual plates that I have taken and I have here with me as well. The results so far are the following I have observed on plate images which act on the silver halide grains they will darken the silver halide and form dots trails and patterns the most precise pattern I have had has been the water molecule pure h2o and there I get a double spiral pattern and what is truly remarkable is that when you go back to the book by George Leadbeater and Anna passant occult chemistry and you look at the Nu or the atom as described by them you will see that picture on the plate that I have taken now if that is not a coming back to home. Now what I find is that the camera generates particles of energy of varying velocity the camera generates particles which when they impact on the plate have such velocity that they will not sensitize the silver halide but form tracks these tracks now are of multi-layer dimensions, the film that I am using at this time is a film design for Lantern slide projection so it consists of a glass plate with a silver halide emulsion on it gelatin and then a top coat of gelatin as well so it has a protective film on the top when I carefully study these tracks with darkfield ultra PAC microscopy using a 42 X objective I see that that top layer has been etched with tracks and these tracks have periodic oscillation to them there is a periodicity according to the program that I set up in the dials and intension that I put into the Machine that periodicity is concomitant with my intention I'm beginning now to see the geometric form of thought because the mind of man expresses his thought in geometric patterns these geometric patterns are identical to what we see in the crystallographic world the geometry of mind and the geometry of crystallography are identical and I'm beginning to find them I'm beginning to see the bravest angles and the space groups one sees in crystallography and this I am dedicating my life to because this is science and not illusion or imagination. I wish at all times in this work to remain a scientist to be focused in thought to achieving truth and not a mass of illusion because one can be lost in a quagmire of information which has no substance to it but it is our intuition that guides us it comes from a higher power to look for that but not this because in that haystack are a few needles and I'm going to now show you some of these needles this crazy microphone nineteen hundred and seventy four I had the opportunity to visit George Tansley at Oxford England and go with him to Lavender dour and miss Beuerlein at Swinburne cottage in Oxford England they had in their beautiful cottage many hundreds of years old in the third floor the Attic the only existing mark four DeLaWarr camera they have had that camera close to 15 years and have taken hundreds of plates with the camera, however they could only make images when ever Corte came to their cottage loaded the plates the same as he did with George DeLaWarr and then they had images, they persisted for 15 years and thousands of exposures with no result except for Corte. George DeLaWarr suffered the same experience he suffered the ignominy of having the camera where he got magnificent plates one day and then tried to demonstrate to a group of scientists from the Royal Society and nothing but blank plates to the end of his life he never had the understanding or explanation of why this did not work, except to say that Corte had to load the plates, I was with Corte a few months ago and right after I spoke to the radionics Association in England he has an obsessive fear of the camera he himself cannot operate the camera he had tried repeatedly he told me personally that they made 2,000 exposures on the camera before they got a single plate but with what they thought was meaningful results 2,000 exposures at the DeLaWarr laboratory is only the base cabinet but not the top electronics or I'm sorry optics. I said Corte you can put it together why don't you operate it? he will not for this reason. I now have the camera because when I went to England and just before I went I read this book "New worlds beyond the atom" by Langston day and I wrote in the book I can operate this camera because what is required is the principle of electro photography namely you must apply a charge to the plate and once you impute that charge a separation of charge must take place similar to the phenomena of an electric and then when a photon of radiation strikes the charge will come together and act on the silver halide prior to my going I had worked with quartz crystals as a power transducer for the energies of mind, I found I could transfer charge with these devices in space act on photographic film but above all act on the photomultiplier tube in space and watched the actions on a scope so I said it is logical then that I can take a crystal of this type charge the plate and we should then get images equivalent to what the DeLaWarr's have been doing. So I went to the lavender tower and Miss fair line and we work together with George Tansley for one whole afternoon and here is the result that we obtained I used the image of my heart chakra and this is the image I got of my own heart chakra it was a heavily exposed plate the remarkable thing when we tried to clear the plate in the silver halide which was exposed it would not clear in fresh hypo I had to reach in lift the plate out and expose it to the light that was going on and then the unreacted silver cleared when you look closely on this picture you will see points of light what is referred in occult teaching as the nadis is the etheric Network the crossover points of energy fields are visible here I did this eight times in a row and each time was able to repeat with the uncharged plate which was totally blind I said that's enough it works it's real here is the crystal here is a procedure that we have set up go ahead and do it. To my sadness they could not do the work themselves as a consequence year and a half ago I wrote to them requesting the camera and they have sent it to me and I now have it in my own home. In the camera there are many subtle but precise settings that are required and in the second half we will go over that you will see it then on to videotape you calibrate the camera with copper sulfate cuso4 and you get these tracks of the atomic radiation coming from a charged particle the charging is with your mind the energy moves out as ray patterns as it impacts at a point in space that you see here, but what the DeLaWarrs did not do and I was truly guided to investigate was to go within the plate itself. I was given channeling on this, I said is this information complete the answer was no, you must go within, and this is the way it works, so I went within with the microscope using dark field lights ultra pack objectives 42 X and now in going within the plate a whole new world emerged which now I share with you. Now I'm going to stand here the glass plate is here and the scaler is given as well and what you are looking at will be the actual that each line division that you see is ten microns this is dark field so the engraved lines are shown as double lines now the first plate that is shown are the tracks that we're seeing and if you notice the systematic beat of the tracks and it's by lateral in other words it has a rhythmic pulsation to it these angles are consistent as well magnification here you're seeing is close to 800 diameters you can measure that if you compare each line up there is 10 microns, next plate here's another finer track you can see the beginning and the end of a track and that in that track there is a rhythmic bilateral pulsation and then there is a transverse line coming from that, another one, now if these don't look like atomic particles I don't know what is. You can see the point of contact and the ring out a longer one and a shorter one these are the actual negatives the prints are in the notebook here that you can look at afterwards next one this is another track but when you look closely this one now is acted on the silver halide so each one of these minut points that you see here are composed of dozens to hundreds of points of energy not light energy acting on it's like a little tiny multivibrator pulsing on that plate producing these minut points and each one of them are precise and exactly what I am referring to is you take one small dot and inside of that dot is a whole series of myriad arrays of points which are exact said it this is just one plate now here is a two tracks the track to the right is an exposed silver halide track in other words a energy which is photonic acting on the silver halide the other track is highly energetic beyond that of the acting on the silver halide and is grooving the emulsion the plate itself I'd like to show you from which I have taken each one of these photomicrographs and you can't see it because of the magnification but these things it takes me about a week to work up one plate like this using a stereomicroscope up to 200 diameter magnification I examine and carefully I have a grid eyepiece then I go over and grid then then I start the process of marking. This plate that you looked at is a study of a quartz crystal the healing crystal I'm in the process now have tried to get the patterns of energy that radiates from a crystal that I'm holding here in my hand so this is a study of the energies released from a quartz crystal now we'll get another set. This one is copper sulfate and you will see a completely distinct difference in pattern watch out for the plate. I'm really taking my life in my hands to bring everything here but I wanted you to see, here's another track very similar to the other one now watch some of the next series that you will see evolving very peculiar bilateral rhythmic oscillation, next plate, they are spiral there are swiveling because as I focus in optical sectioning going to higher magnification these are true styles if I take five pictures and do optical sectioning of it I come up with the helix these are helical structures some go to the right others will go to the right left most of these are turning to the right. In the use and study of these in quantum physics you measure these angles, I find many of these are precisely 90-degree right angles other have differential angles to them and I'm starting to accumulate a library of these type of angles, next plate, look at this one you saw they begin almost the s the beginning and here's the end of the track it's a corkscrew spinning in space these energies are spinning in space. I have yeah here's a beautiful now again is on the silver halide and it has unfortunately those of you back there cannot see if it is a very precise systematic pattern I think I have one more which is a big track. I set the program and I blanked my mind I've become one with the machine when I do that Christopher I feel a vibration I'm I cannot breathe during the one minute exposure I do not breathe I am totally linked to the machine I can do about three plates in one day's time. These are all types of energies that we're generating I'm just unappealing the cosmos that is correct this you're seeing for the first time I believe no one before has encountered this it I had to go within I had to get help from counseling from channeling for me to have done this. Now look at this one look at the systemic spiral this is blowing up now to 2000 diameters that is not now with the 42 X but it's oil immersion with a hundred X objective so it's over two thousand diameters of this small one of these small tracts and you can see the precise oscillation that is going on there yes bring that up a bit . In this period that we are together is give you some fundamentals that I've learned over the last ten years of studied my training is science and what I define science are as rather is the study of the events that happen in nature that can be repeated and then a theory attached to it that can be understood by the mind of men, we have different processes of our mind in when we deal with what we call matter, with what we see with our senses we can receive an impression only through the senses and that limits us to the electro magnetic spectrum. I am a microscopist I have done now close to 23 years of work and study through the optical microscopic medium if you dealt with your senses alone you could never succeed in the field of optical microscopy. I have many hundreds of times captured on photographic film images that I cannot see with my physical eye I use my physical eyesight to align the optical path within the limits of the correction mechanism set up in the microscope, I then activate my third eye the sensor that we have between our physical eyes and begin to scan and look for the information content that is there, the pattern the summary of knowledge, I said knowledge because every bit of matter or energy moving in space is not random but accretes in systematic patterns reflecting its origin and once you can look for that, you go beyond seeing and you start feeling, you look through the object and see it in multi-dimensions and that is the core and the secret, namely I can see beyond a plane and get to that critical optical sectioning that brings that form into being. Now I am sharing with you something that has taken me 20 years to learn when I make an an exposure through the microscope I have a zeiss ultra photo 3b automatic camera microscope it's about a half million dollars of equipment but still the operator must be there, I then work with the fine focus and start oscillating the fine focus up and down against an optical section that I set with my subconscious and higher mind my intuitive mind now that oscillation produces a sharpness of image which transcends the normal vibration that takes place in all matter because as I illuminate with light it causes that object to vibrate no matter how steady how much on a rock I place the microscope, but by building the vertical trajectory on a sub micron level I get a sharpness to image which is remarkable, these pictures that you see here that I've shown you are the result of that am I going in and some of these exposures are one to two minutes exposure so I'm holding everything steady no breathing totally focused and locked in to capture that moment of event and that is how you get them. It is now a integration of myself into the microscope the microscope and myself become a unit instrument I and the microscope know and love one another, there is a sympathico a relationship that takes place, to learn curler illumination the critical control of the optical path I took two years of work night after night practicing till my eyes burnt I could barely see but at the end of two years I was ready to compete in the microscopic world and I did against the biological photographers Association and received the Charles W foster award. Only when you can bring the machine up to its maximum atonement can you transcend it you've got to bring any equipment to its point and when you get it to its point you move beyond the point to infinity then you're free then you explore. We are obsessed and I underline that word with magnification we've got to get an object bigger and bigger so the only way to go is to an SEM or to finally to a electron microscope, it's not the reality because when you pump and put an object into an electron microscope it is dead, the life is out of matter when you put it into an electron microscope be it an SEM or TEM transmission electron microscopy you only deal then with a replica. All matter in form has life to it all matter in form emits a radiation all matter in form is emitting its note characteristic of its pattern or geometric structure but above all reflecting in space its reason for existence but when you put it into vacuum and pump it down to 10 to the minus eighth or ninth that vibration ceases and you see only a dead skeleton. Reflect on this, think about it, we have the ability when we mature and I'm only in a kindergarten grade at this moment with this DeLaWarr camera of capturing on film the ADEA metric form and pattern of thought we have the potential ability to truly see and measure thought Holograms. Thought now can be linear two-dimensional in form try in linear three-dimensional in form and finally multi dimension where we move into infinity spiral helix. You take light ordinary light that we have here we polarize it with a linear polarizer what that does it takes the Rays of energy and combs it a linear polarizer will take the radiation and so you get then purely a transverse odds of oscillation going in one direction I put another polarizer at 90 degrees and it extinguishes the radiation the light goes out because now the transverse polarizer allows no ray to pass through it. We do a very simple but remarkable event we put between the polarizer and analyzer what we call a quarter wave plate a mica plate what happens the ray of energy is bent and starts spinning we get then optical rotary dispersion or circular dichroism CD the energy of that radiation now spins we can have them a right-handed or left-handed spin to this radiation in the DeLaWarr camera is a polarizer, on one of the pass the path of the information of the object to be exemplified it, is the most difficult setting in the whole instrument of knowing exactly where to set that degree of rotation watch Andrea to start the elliptical rotation. When I don't get the set incorrectly I get two straight lines but when I make the proper setting to the polarization of that energy it starts spinning I come up with a whole new form of energy. We have so much to learn from this machine I'm going to be building in the immediate future a DeLaWarr camera attached to a video system so we will be able to see in video the holographic patterns of thought, that thoughts are geometric and that in a geometric pattern of thought is information stored. Once I bring the geometry of thought and its crystallographic patterns into coincidence with the crystallography and patterns of the mineral world we find I am certain these will mesh fit and link. It is my belief speaking now to you as an individual that this is the computer of the future, a mind computer, the ability to store them patterns and to read them back we need but draw our breath. I awoke one morning and in my mind class the following words records are written in stone records are written in stone and a repeated repeated until I accepted the thought and then started to act on it this is two and a half years ago records are written in stone not on still but in, as I reflected on these words and started the process of study I realized that with in the lattice of a crystal is enormous space but not empty space, that we, you and I can occupy that space, when we occupy that space the crystal oscillates, it vibrates in harmony with our occupation of this space and then emits a note a tone which is synonymous with that vibration, that is the backbone the fundamental basis of my cutting crystals for healing, for the therapeutic use of these in medical practice and in the release of traumatic conditions in the bodies of individuals. This morning I will show it to you I am going to make a predictive statement to you what I hold now in my hand is the radionic instrument of the future it has all of the properties that one does with a black box, it has all of the forces that one needs in healing and it requires only that one train one body to deal with an instrument of this way. What you require in training is breathing exercises detachment being loving and not afraid to move into the future and try, above all the release of fear of the unknown. One day when I was on a television program an idea hit me and I went in with this was in New York and tried something I had never tried before and I'm going to do it now for all of you, and then as I do it reflect on the whole philosophy and theory of radionics, in radionics we have a rubbing plate the function of the rubbing plate is to connect the program that we have in our mind and the object we are trying to attune to and when we come to resonance we get this stick the locking of the finger to the surface. The original Delawares use rubberband and the finger sticks the later systems use hard McCarter plates the ultimate rubbing plate is a crystal because I can put the entire program of whatever I want instead of twisting a series of dials I take a deep breath put my intention between my fingers and now I have the primary oscillation I can attune to. Now I'm going to link to my own body to this by taking a deep breath and as I release my breath crystal links I'm linked now through breath into the crystal put my finger on I cannot move it's totally locked now to release watch draw the breath in now then suddenly let's go let the breath out again. The intention I had was linking simple program now to attach to you focus on you and as I draw my breath in release the breath now I'm linked and you can feel a vibration being propagated to you the field is coherent between my left fingers is a vibratory radiation going on describe your sensation Dr. Nam right now watch when I draw my breath out, it's gone, the feel spirals the end of this crystal releases a spiral of energy in one direction the reverse direction has been cut by me in this one side is positive the other side is negative. I am making now a grouping about 25 crystals for the Radeonic Association in England I go there in October and will be teaching their people to use these crystals in radionics the primary thing that I will be sharing with them that this becomes a precise antenna that they can direct the radiation to and reduce at a quantum jump the time of treatment from days to minutes there is no reason or need for the length of time of treatment because once the thought-form is released and injected no further treatment need to be given. Thank you very much yes this is natural quartz crystal from Arkansas and in the second half I will be going into healing with the crystal but applying all the principles I've spoken to you about yes I have made this myself I've cut this from a natural six sided crystal this is now four sided I attune a crystal like this for the resonant frequencies of my body I balance it so that it is a total reflection of myself it's a precise Radeonic instrument. Because in a natural crystal is stored the entire pattern of the history of its manufacture of its growth I have to cut away the eons of time that it is taken to grow to bring it into a new form give it new life by cutting it, fiscal vibration of cutting it shatters the feels-like natural crystal I cut it and the varying pressure I put on it I go into battle with the crystal physical battle using a 75 grit diamond flat lap and as soon as the crystal has given up the tone changes there's a difference in tone and then the crystal starts a polished and cut freely, but in the first stages is a growl as a noise it is a battle, yes no I cut the crystals for I can do that right get the tone for you I pick it up from your signature or your intention because once you broadcast what you want to do that becomes then available and then I draw on that. You set up a frequency of your own body vibration it becomes insular and oh and only available to you, if it will do that but that does not bother you because you're in a vibrating frequency far beyond that of the electro I don't know yet it's still a mystery to me I've had to reverse the process of scientific application I've had a start from intuition doing, making and now I'm trying to learn what I have done. Very simply if you're in the with me I have demagnetized a crystal first with either demagnetizing net electromagnet get its basic rate with the radionics equipment then you hold the crystal and then I get the difference of it and that's your rate then I cut the crystal to fit that it fits exactly. This is the original shape I got from the Kabbalah the study of the Kabbalah that one sees in her reads of the Tree of Life and one sees this form in that when you see it you had a question at times yes well you make variations in your life I've had to cut two and three times we face the tip for the doctors I'm working with them working with about 20 medical doctors in San Jose and San Francisco and Sacramento these are surgeons orthopedist obstetrics gynecology we're finding as you saw in the article those who've you've read it doctor Lascaux has gotten extremely good results with herpes in removing of the symptoms of itching the pain with just a single application with the crystal. The article I'm referring to was in the radionics review from England now let us carry on, as the atom is the unit of matter and expressed itself in a physical form we have in the pre physical state of being a energy we can call a vitality globulin these assemble together to form the units of life energy forms they are geometric and crystalline in their shape and form. They form into dot patterns points of energy or points of light they can add together into dot arrays they form lines or they can assemble in circles squares rectangles triangles they assemble in space according to sound which accelerates these globules until they link together and form three-dimensional patterns, the resultant form then of these one dimensional shapes two three-dimensional forms evolves crystallographic patterns, these structures and begin to hold information because they have them the ability to oscillate in many directions to hold information by the change in the pattern and form. An idea is two-dimensional geometry a thought form is three-dimensional geometry these three-dimensional forms and patterns the mind enlivens with a vibration the soul is light, light and sound are synonymous ergo the act of enlivening is to put life or pulsation or rhythmic vibration into this form, much the same as what takes place when I take a deep breath focus on the crystal and pulse the crystal vibrates, a vibrant life energy ensues. I think it is coherent because it is linear it is point-like and it is little time much the same as one sees in the speckle that one sees in a laser see these little points of life and the speckling action I see the same thing in these type of points and these are tracks that come from it but they repeat now this is the research is to find these patterns to find the conditions to measure these patterns which exemplify the light principle that matter has when thought imbues in it matter and energy are interconvertible but it is not the complete aspect of the Einstein equation what is missing is that preform the pattern of thought that holds matter in its form and that my friends is what I'm after. I've been led to this in the early stages with the study of man plant communication, I used a simple life form a philodendron as a indicator of the energies of mind I will show you now a series of foils that are exceedingly interesting these were done many many years ago nineteen hundred and seventy one and seventy-two let's put this one up now these exemplified much of what I am talking about the best way I can describe it. In here now we have on the upper track the 60 cycle hum of the equipment what you are seeing is a output from a Wheatstone bridge in which the two electrodes are connected to a leaf of a plant a philodendron, up and top there that's my 60 cycle hum now when I take a deep breath draw my breath in you will see a change in resistance I'm 15 feet away from the plant I'm not connected to the plant I'm just focusing on the plant I hold my breath then I release the breath, each small horizontal division is 1/2 millivolt so the horizontal division is 1/2 millivolt for a small division these are hefty signals, I then repeat the breathing process keep on the second third fourth time and suddenly there is a saturation in which now the deep breathing produced no further effect there is a equilibrium that takes place. This shows a charge transfer mechanism taking place between my body and the leaf of a plant from these breathing experiments I went then to working with a crystal we put this one on in which now I held a crystal healing device first in my right hand and then in my left hand the top part is the balancing of energy charging of the plant with breath that you saw before and suddenly you see that come into equilibrium and no further change in other words my field and the plants field now become one, a synchronicity of vibration between the plant and myself so any small change now is manifest and recorded we come now and lift it up to the bottom track I'm now going to pump energy, like this rotate focus and then oscillate and now you see the results left hand you see spiking taking place which is identical to action potential stimulation that one sees in electro stimulation of nerve endings you see the spiking taking place here you see it here was just taking a crystal and just doing this to the plant, I go now to the right hand and look at the difference in frequency more than a doubling of the rate of vibration. 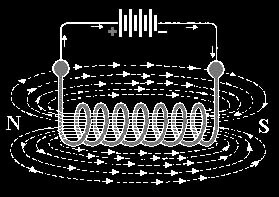 The remarkable thing is this diagram that you see to the right this laboratory oscillation takes place each time the act of healing is done on a patient when I focus on a patient or an individual I wish to serve or be of assistance to these type of rhythmic vibratory oscillations take place. There is an energy transfer which is rhythmic pulsing and works in time up to at times five minutes and then abruptly will shut off there was a saturation, so the energy one uses in healing can be observed and measured with a simple instrument like a plant. The source of energy comes from amplifying the field with the crystal one can go deeper now so I've done in this one where I used a narco physiographic equipment and did multiple imaging, this experiment was done with Dr. Lee Sanella a projection of a thought-form from my home in San Jose to Berkeley California yes Tommy Wright GSR galvanic skin response yes now this is a multitrack system GSR and narco equipment so I had here the blood plasma graph of myself the GSR on the plant is the second one the third one is on myself and the blow is the timing in seconds and so I was at nine fifteen and a half where you have the red-blue mark and each one of those lines were one second within a few seconds when I released this thought form of a Star of David Dr. Lee Sannella recorded the same identical image in Berkeley there were seven other people that he was with. So as within at it's a closest I know to exact timing of a mental thought the amplification of these signals that you see here were done by me with a crystal held in my hand, I were using crystals as an amplifier of the field, whole breath just hold the crystal quietly project the thought and now you see the signal as it was released there is the image release exact coincidence with the plant myself and the response in my blood physiology I don't know of another graph showing the coincidence of physiological changes when you release a pattern of thought. Now let's move to the next thing does a thought-form exist in time and this is the exciting thing when you create a thought, there is now brought into being time and the best way I can see this is the following, here is a pattern that was taken many many years ago now but Dr. Dorfman a nuclear physicist in which he sat in my living room, I tuned mentally into him locked on to the plant and now had him think of his wife and you see then the bottom small burst and you have then 104 seconds the pattern of thought of Dr. Dorfman thinking of his wife. I asked him to do this again the second time and here this is the third pattern this is the first one the second and now if you can bear with me I will overlay these here, there's three we've got three okay overlay the two of them show them top and bottom and then overlay him, that's two and then three now look at the coincidence that's two events happening subsequent to each other a thought-form being released in space and look at the overlay of data lift one off and lay it down again. I mean those of you who have done an analysis of images you can realize the code there is no coincidence to this, these are repetitions of patterns, the unfortunate thing is that Dr. Dorfman did not want to accept this and threatened to sue me if I were ever to publish this data, but he did this with me. Push them apart from each other within one second of each other of the same all the patterns that there was more detail than one against the other number to point out to number two is that is number two and number three is right below it there you see there's more detail appearing now because he's working out more in his mind, but they overlaid on each other now the ultimate pattern I don't know whether ever do this again he worked at the linear accelerator slacks and I asked him to go with his mind to the linear accelerator and carry on in the experimentation and here is his mind moving to the linear accelerator, and now you can see a pattern of about a hundred and forty some odd seconds duration what was exciting in that series I asked him to repeat part of his experimentation he did that and when I we overlaid those graphs on parts of the experimentation bits and pieces of this fitted together. Here is a pattern descriptor here on a graph of an entire mind experiment, so we do radiate in space these patterns of energy. I have found that it is not limited by time or space one can do it in a room or one could do it 8,000 miles away and do the same thing. I have to link to you I become a shield I remove all secondary interference so I can get a clear signal otherwise you would have a signal like this with a mass of noise, other people who have done the plant experimentation I've tried to time and again to tell them this you are intimately part of the experiment if you don't do that you're going to get this signal superimposed in a month a lot of noise you have to do then a Fourier transform to pull out this signal I did the Fourier transform I cleaned up the signal to get a pure pattern and there you see the result purely by intention the intention was I want to get a clear signal of your thought of your experiment and out that comes it's not very complicated. Now pardon me, oh yes, I did it for about two hours bits and pieces I have a whole string of charts on that about six or seven or more and this was a total experiment than I did parts of it I would get this part repeated or this or this so in a sense there was a complete code of the pattern of thought here now my friends take a look at this and look over the blackboard here on the DeLaWarr camera you see the similarity oscillations and tracks like them. I'm trying now to take this which was done in 1971 into 1983 with a camera capture these patterns of thought and bring him into physical form that we can study as doctors scientists physiologist because we permeate space with thought we inject our mind into everything we do and we must learn to be prudent of how we act and the way we think. Now our mind, your mind releases a coherent vibration composed of a fundamental tone which is your body vibration, modulation of this tone is the FM modulation of this carrier wave with the information data and through this means we move matter and bring this information into form. Man is made to the image and likeness of God, in the beginning was the word, and through the word, matter came into being. We are capable of creation. It's interesting to note that radionic pioneer Hieronymus observed, in a Paris meat market display, that the freshly placed organs of different animal parts were causing the frost on the display glass above them to crystallize in specific patterns associated with the different parts of the body. Showing that the life force still emanating from the organ had a unique radiating pattern that was affecting the sensitive crystallization process of the water thus capturing these eminations. Marcel felt that it was extremely profound and significant discovery that all of the crystallographic forms of the 7 major classes can be formed in water as it is going from water to ice crystals. Showing that the geometrical matrix of water, which has similarities of tetrahedral and hexagonal structuring of quartz, can universally conduct the spectrum of geometries manifested in nature. This discovery of water was made from drilling deep core samples of frozen water taken from the Antarctica. Dr. Masaru Emoto, the author of "Messages in Water", was the first water researcher to discover a method for visually revealing the structure of water. Through high-speed photography, he has been able to capture how our thoughts affect the structure of water at the moment of freezing. Dr. Emoto and others have theorized that water has the ability to receive and transfer what the Japanese call “hado” (vital energy) Water is a network of hydrogen-bonded molecules. It can form numerous structures, depending on how individual molecules bond together. 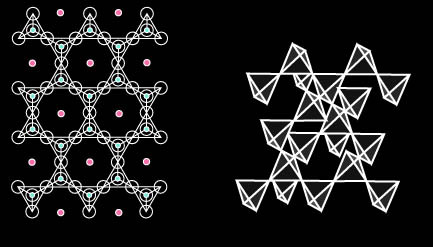 One of these structures is the hexagon - composed of six water molecules. Hexagonal water forms an organized crystalline matrix with properties that are different from ordinary water. Hexagonal water appears to play an important role in biological functions. It is being linked with improved hydration, enhanced nutrient absorption, DNA function and improvements in metabolic efficiency. The amount of hexagonal water in the body has even been correlated with aging. 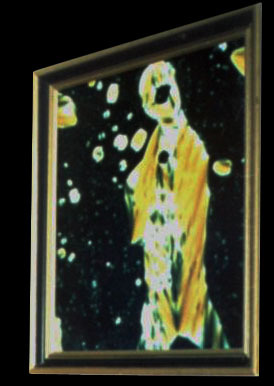 In this work by Dr. Emoto it was shown how thoughts affect this crystallization process. The human body consists mostly of water, approximately 70 percent. The formula for water is H2O, meaning a single molecule contains two hydrogen atoms and one oxygen atom. But water is far more complex than this simple formula seems to indicate. On a molecular scale, water is very "sticky," the H’s from one molecule are also attracted to the O’s of surrounding molecules. Thus, water molecules attract each other and tend to clump together in a network, constantly assembling and disassembling bonds between neighboring molecules. Marcel hypothesized that these molecular "clumps" (actually cells of liquid crystal) are capable of storing information in a manner similar to how computers store data on a disk. The dynamic nature notwithstanding, such information would be permanent and detectable. 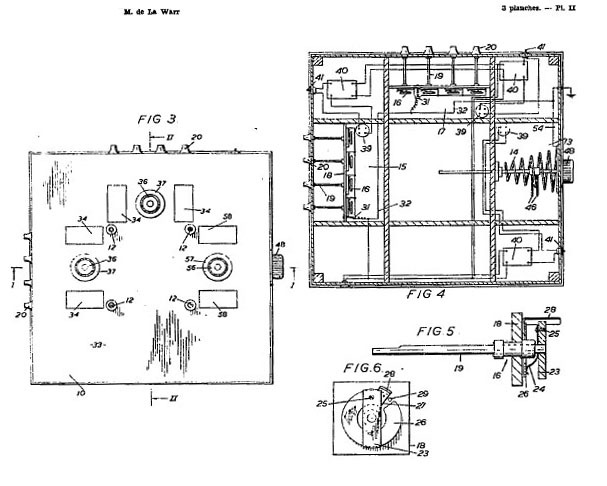 Marcel believed he had found evidence of this restructuring in spectral analysis of informationally processed water. Water, as ice, forms a crystal of hexagonal symmetry (meaning the shape is six sided, as witnessed in snow flakes) with tetrahedral coordination (that is, each molecule is associated with its four neighboring molecules). Water’s formula, H2O, is the "inverse" of quartz, SiO2. Like water, silica is also hexagonal with tetrahedral coordination. Being a solid, any information impressed upon it is fixed within its macromolecular structure. We can visualize these structures as a kind of vast three-dimensional harp. Information is stored by causing specific bonds to resonate etherically, similar to a musical chord. Unlike a harp, the "sound" (or vibration) never diminishes. Stored information is permanently fixed until one chooses to erase it and begin anew. The molecular structure of water as ice or in liquid crystalline form is fundamentally the same as that of quartz. The below image illustrates the similarities between the structures of ice and quartz. Marcel found that information mentally impressed into quartz crystals could be transferred to water. The process was called "charging water," and once charged, the result was both permanent and measurable. He found that charged water developed a new absorption band in the ultraviolet. This is like saying it changed color! Since early in this century it has been known that quartz is a resonator and amplifier of energy. It is a vital component in many electronic devices. What was not known is that quartz crystal is also capable of amplifying "subtle forces" including thought energy. The reason this had remained difficult to demonstrate is that, regardless of how fine the quality of the crystal tested, the conditions under which it was formed were highly individualistic. Simply stated, no two crystals are identical, and in science, a theory cannot be based on a single case. The amplification of thought energy includes so much "static" (other vibrations) that it becomes lost in the noise. Marcel discovered the answer to this problem. He found that when quartz is cut along the c-axis (the line of symmetry within the crystal perpendicular to all other axes) in the shape of the Kabalistic Tree of Life, it resonates to ONE frequency. It so happens the frequency (which turned out to be 454) is the same vibratory rate he also measured for water. Therefore, Vogel-cut crystals are powerful instruments capable of taking thought impressions and literally injecting them into the matrix of water. From this work he developed three tools: the double terminated healing crystal, single terminated meditation crystal and the Star of David crystal medallion. This crystal device can be utilized in the directing of healing energy by impressing it with the desire and intention to do so. Although it seems like magic, actually it is more technological. The energy field created by the brain (a bioelectric organ) sets up subtle changes in the energy states within the crystal. This is similar to the "observer effect" recognized by modern physics. As an amplifier, the crystal increases this effect to the point where water can accept the same changes. Marcel demonstrated this in his laboratory. In a repeatedly performed experiment, he impressed the intention "to remain pure" into a healing crystal. Marcel then injected this "information" into fruit juice. He kept two uncovered glasses side-by-side, one treated in this manner and the other as a control. Over a period of months he observed that the treated juice remained clear and fragrant; the control became cloudy, filled with mold and bacterial growth. In a similar manner, the intention to heal can be transferred through a crystal. The body, being mostly water, accepts the charge immediately, often with dramatic results. One of the primary areas of investigations at the Psychic Research laboratory was the relationship between water and quartz crystals. It has been found that by circulating water around a charged tuned quartz crystal many changes occur in the water. These changes are referred to as structuring. The value of 454 represents the radionic signature, or the fundamental numerical identity of the information band of the water itself. It should be noted that the signature radionic measurement of a tuned crystal is also 454, indicating some connection between these crystals and water. This connection or resonance is not found in unfaceted quartz. As we know, water consists of one oxygen atom and two hydrogen atoms that are held together in a covalent bond This is an actual physical force, much like gravity, that holds these atoms together. Structured water can be thought of as water that has a greater degree of bonding between adjacent water molecules than does unstructured water. 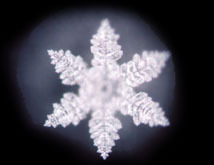 Structured water also forms a crystalline-like structure consisting of elongated chains of molecules that can be differentiated from the surrounding water molecules by qualities that are consistent with qualities found in liquid crystals such as increased birefringence and a lowering of the freezing point. A microstate is the angular, geometrical alignments t hat water molecules have when they are in the structured state. Quartz crystal shows a microstate but not a mesophase, as it is a permanent state solid rather than a transitional state or semi solid. When the various angles of the quartz molecule are investigated, a possible basis for its resonance with the water molecule is found. The fundamental geometrical pattern of quartz and water is the tetrahedron. Water molecules, bound together, form tetrahedrons in tilted or puckered rings. This tilting happens because of the bonding angle that exists between any three water molecules. This angle is 109.5 degrees. The normal flat hexagon has angles of 120 degrees. Water molecules with smaller angles, if they are to be formed into a hexagon, must have an uneven structure that is not in a flat plane but is instead a three dimensional object. This uneven structure is formed by what is called the bending angle or angle of tilt. This angle can be between 20 degrees and 60 degrees, but the most common is 26 degrees. This is where the intermolecular bond is the strongest and it happens to be half of the interlattice angle of quartz. The second most common bending angle for water is 54 degrees which is quite close to the interlattice angle of quartz as well. The interlattice angle of a crystal is related to the basal angle. 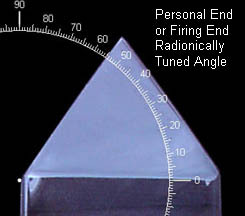 The basal angle is ½ of the angle of the tip of the crystal. The interlattice angle of quartz is 90 degrees minus the basal angle which is 38 degrees. Therefore the interlattice angle is 52 degrees. This is also the angle of the Cheops pyramid. The intermolecular bonding angle for the water molecule is 104.5 degrees. This is the angle that exists between the hydrogen atoms of each water molecule. It is virtually double that of the interlattice angle for quartz. 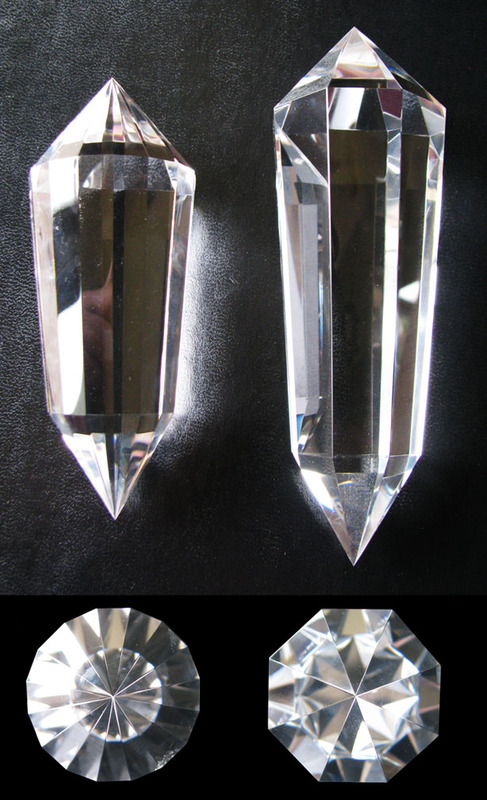 It is possible that there is a compatible harmonic between water and quartz because of the similarity of these angles. This would allow a resonant transfer of the energies that are imputed to the crystal to a significant group of water molecules in any given sample. The structure of quartz can replicate itself in water because of this resonant transfer based upon structure. The geometric structure produces frequency patterns, harmonics, that can transfer into water. Very small amounts of energy are required for this transfer. The nature of resonant systems is such that a minimal input can achieve a maximal output. Resonance transfer occurs because the energy waveforms coming out of a vibrating substance have nearly identical waveforms. The phase relationships of a resonating system can be defined in terms of the angular separation that exists between adjacent molecules. The six molecules that form one hexagonal ring, when in resonance, will vibrate or broadcast its energy on a wave that has a particular frequency. The first molecule will vibrate influencing the second molecule; the second will affect the third, and so on. The time intervals between successive broadcasts will result in a phase delay which can be converted into a phase angle. Successive waves coming from an oscillating system have successive phase angles that equal the angular separation that exists between members of the system. The phase angle within the vibrating ring of water molecules is 60 degrees (360 divided by 6). If there were 7 molecules in the ring the phase angle would be 360/7 or 51.43 degrees. This is the principle phase angle of quartz. Most of the internal angles of water and quartz are either fractions of this angle or multiples of it. It is the interlattice resonance between the quartz microstate and the lyotropic mesophase that is the determining factor in the formation of the lyotropic mesophase in water. It is the reason that water can be structured by spinning it around a tuned quartz crystal. It does not require large amounts of energy to accomplish this. As an example of resonant transfer, one can imagine a series of dominoes being placed across the United States. from San Francisco to Washington. Each successive domino would be slightly larger and heavier than the previous piece. By the time we reached Washington, the final domino might be as large as the Washington monument. By applying a slight push to the first domino, less than one pennyweight, each domino would be knocked over until the final piece was toppled. Through the introduction of a very small energy to a system the result is the production of enough energy to knock over the final very large and heavy domino. 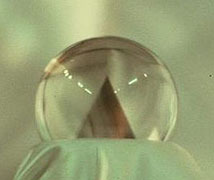 The structuring of water around a tuned quartz crystal is dependent upon the program that is imprinted into the crystal. It is the program that brings about the abrupt change in state. A fundamental program that can bring about dramatic changes in water is that of unconditional love. In the structuring of water and wines the question was whether there was a field created in space when the water was spun around a crystal. 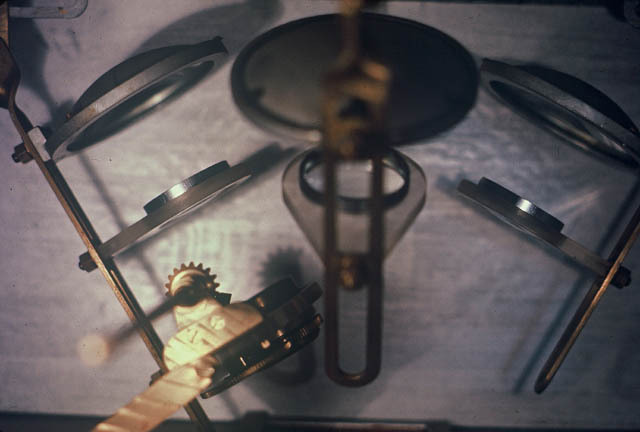 A GE magnetometer was attached to the inside of the structuring chamber and a series of readings were taken when the water was spun around a charged crystal. Within the chamber was housed a stainless steel coil, the tubing being ¾ inch in diameter and with seven right hand turns. 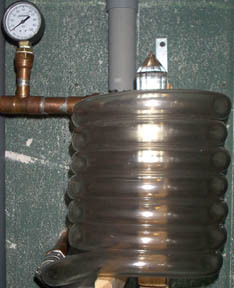 The diameter of the coil was approximately six inches. 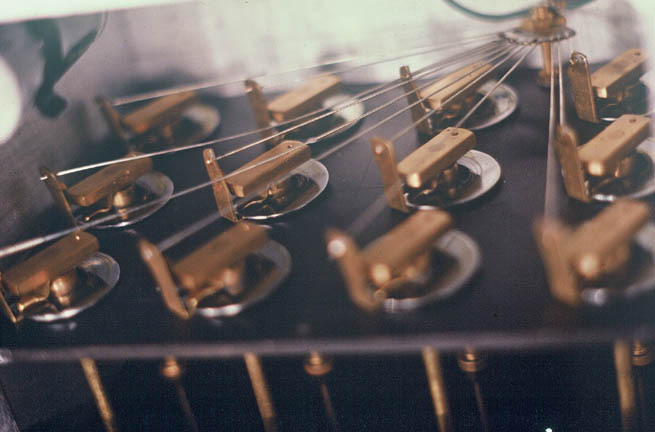 The programmed tuned crystal was placed, with firing tip (the more acute termination) downwards, in a specially designed holder so that it was in place within the coil. The chamber or enclosure for the coil and crystal was made from pine and finished with shellac. 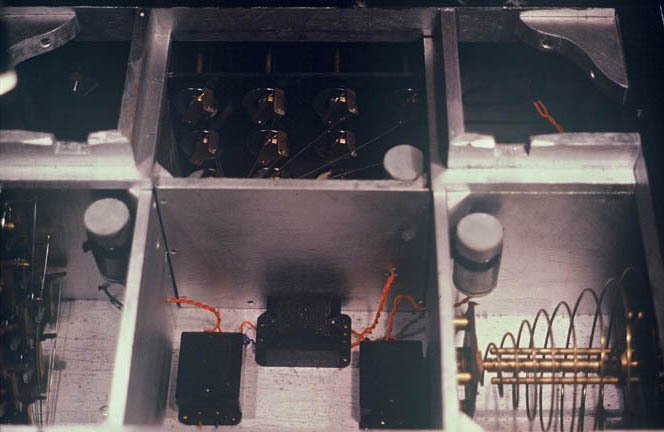 The magneto- meter was mounted on the side of the chamber with the probe placed in the space between the crystal and the coil. The temperature was kept at 70 degrees F with the chamber sealed. 1000cc of water was used at all times. 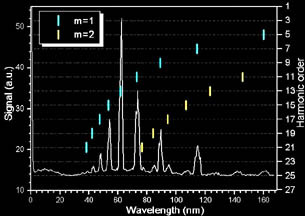 For each pass around the crystal, a 50cc sample was taken for an analysis with the Omega 5, a 50cc sample was taken for pH and conductivity measurements, and a cuvette sample was taken for infra-red and ultra-violet spectro-photometry. 7) Water is made to be a permanent magnet. This field remains constant after the water stops spinning and can be removed by the application of a bulk demagnetizer. The crystal, in this case was programmed with the intent of unconditional love. The water could be programmed with specific information depending upon the nature of the information programmed into the crystal. If, for example, the crystal was programmed with a sedative, the water would take on this characteristic or vibration. Drinking the water would induce sleep or deep relaxation. Practical applications of this process include agriculture, the preservation of foods, as well as potential uses for healing. The energetic patterns of a fertilizing agent can be stored in a crystal and then transferred into water. The water is then used to irrigate plants. We have found on a small scale experimentation that plants treated in this way show significant growth increase compared to untreated plants. Although in most cases it was found that water generated a weak magnetic field, on one occasion a different effect was noted. Normally the effects noted above were attained by circulating water through a Pyrex glass tube coiled seven clockwise turns, around a tuned crystal. By reversing the position of the crystal so that the firing tip was pointed upwards, an energy was released that lifted Marcel off the floor and flung him to the wall. He was standing approximately three feet away from the apparatus when this happened. Afterwards his eyes were burned as if from intense radiation. Water is an unknown because of its familiarity. We have yet to discover the power inherent in this plentiful fluid. When water is circulated and spun around a charged crystal, enormous charge can be released from it. Further research is needed to determine the nature of this energy. It is quite likely that although there is a measurable magnetic field present, it is, in reality, only an effect of something more fundamental in nature than EM fields. It should be noted, however, that the fields present in both the crystal and liquid when charged, whatever the nature of that field, can be cleared by a bulk de-magnetizer. Dr. Glen Rein has called these energies a quantum field or non-Hertzian energy. Dr. Rein has stated that quantum fields are independent of time and distance. This correlates with the observations made by Marcel not only in his work with water, but in his early work with plants as well. His observation is that thought seems to overcome the inverse square law. The term “information transfer” is used to refer to an energetic phenomenon that is not in the traditionally accepted electromagnetic spectrum. Although somewhat vague, the term “information” indicates that there is some kind of discreet coding and not just an unqualified energy. When an information transfer takes place from a tuned crystal to water, wine, juice, or even milk, there is an abrupt, immediate change in the physical properties of the fluid. For example, in 1986 I was given two bottles of wine. One was a prize winning 1983 Chardonnay from the Sycamore Creek Vineyards. The second bottle was a 1986 Chardonnay from the same vineyard, newly bottled. There was a remarkable difference between the two in regard to body, bouquet, flavor, and even color. I took a sample of the 1986 wine and obtained measurements from the Omega 5 in all three parameters: signature value, internal field, and external field. I then used the Omega 5 to program a tuned crystal with this information. Having done this I placed the crystal within a coil of Pyrex glass tubing. 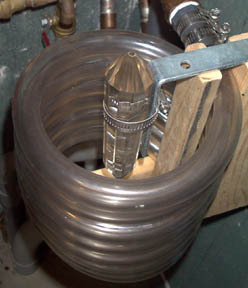 The coil was housed within a wooden box. I then poured the 1986 wine through the tubing so that it circulated around the crystal. I did t his seven times, so that sample one passed around the crystal once, sample two passed around the crystal twice, sample three, three times, and so on. I also kept a control sample. It was found that sample four perfectly matched the 1983 Chardonnay in body, bouquet, flavor, and color. The remaining six samples did not match the ‘83 wine in any way and, in fact, samples 5 through 7 were bitter and almost undrinkable. The fourth sample was then taken to the Omega and measured. The value obtained was then transferred into a tuned crystal. The crystal was placed back into the apparatus and the remainder of the 1986 Chardonnay was circulated around it. In subjective taste testing by all of us present in the laboratory (including the vintners) the 1986 wine seemed to be a duplicate of the 1983 wine. 1) A crystal tuned to water (454) is programmed with information so that a wine will be brought to completion with all of the reactions that are potential in the chemistry. 3) The wine is then measured with the Omega 5 after each spin. 5) The information is transferred to a master crystal and the wine is run in production with the master crystal. When the information becomes critical (at 4x), an abrupt change in the state of the wine takes place in much the same manner as we have seen with the liquid crystals. “ I believe we are seeing in the wine a critical transfer of information which can then cause abrupt changes in the chemistry of the system." The most profound effect of the faceted crystal has to do with its relationship and resonance to water. A crystal that is faceted and tuned to the water molecule will hold a charge or information that when transferred to the body of person will link to the H2O molecule. This charge is stored within the interlattice space of the crystal. Because more than 70% of the physical body is water, the Vogel tuned crystal, with its resonance with water, is the perfect delivery mechanism for the introduction of subtle energies to an individual. It was also thought that the various subtle energy bodies described in metaphysical literature are gradations of a field that is anchored to the physical body via the water molecule. The crystal is a quantum converter that is able to store and transmit energy in a form that has discreet biological effects. It is speculated that because of the cohering capability of the tuned crystal it can be used to affect “reality” at the quantum or subatomic level. The imprint of thoughtforms or coding is stored on and within the particles or wave packets at the quantum level. This is most likely a resonant effect. The human body, on an energetic level, is an array of oscillating points that are layered and have a definite symmetry and structure at both the macro and micro dimensions. The bones, tissues, cells, and fluids of the body have a definite crystallinity about them. The structure of the fluids, cells, and tissues of the body tend to become unstructured or incoherent when dis-ease or distress is present. The physical body is comprised of liquid crystal systems in the cell membranes, intercellular fluids as well as the larger structures such as the fatty tissues, muscular and nervous systems, lymph, blood, and so on. Through the use of an appropriately tuned crystal, to which these structures are responsive, balance and coherence can be restored by delivering the necessary “information”. Much of the above material has been taken from a transcript of a paper presented at the 1996 2nd Annual Advanced Water Sciences Symposium and the 1998 United States Psychotronics Association Conference. 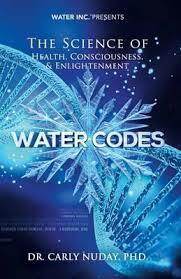 connection between mind and matter..
Dr. Carly Nuday, PHD recently wrote a book titled "Water Codes" which connects the science of health and consciousness in relationship to structured water, as well as other aspects in religions throughout the world. This is a brilliant composition that acknowledges and expands upon the work of Dr. Marcel Vogel in water research. The book discusses several important aspects of water in relationship to the liquid crystalline structure of water and consciousness. What is found in research studies is that the greater the structuring of the water around the cells and DNA of our body, the less entropy or decay occurs. As Nobel Prize winner in medicine Dr. Alexis Carrel stated "The cell is immortal, It is merely the fluid in which it floats that degenerates. Renew this fluid at regular intervals, give the cells what they require for nutrition, and as far as we know, the pulsation of life can go on forever." The waters of our body reflects instantaneously our consciousness and the energies in our environment. Water acts as a "Fractal Antenna" according to Dr. Apollo Stoppelbein, Dr. Nuday's research associate. Energies of consciousness or the environment can be either in harmony or discord in coherence with the fundamental structure of life reflected in the degree of water structuring. The greater the degree of geometrical structuring of the water, has been shown to be an indication that it is more in alignment with that of the consciousness of love, gratitude, happiness etc. As both Dr. Vogel and Dr. Emoto have conclusively demonstrated in their laboratories. Conversely, the greater degree of destructing of the water is an indication that it has fallen out of alignment or resonance with our core nature demonstrated in the emotions of hatred, fear, malice etc. This can also be induced by environmental influences such as ingestion or exposure of toxic substances, as well as electromagnetic pollution such as cell phones and other forms of radiation that impacts the structuring of the waters of our body, sometimes causing cancerous conditions to arise due to the integrity of the supportive structure being compromised. Due to water's unique tetrahedral/hexagonal geometrical structure and it's ability with this structure to universally resonate with all the major crystallographic forms in nature, shows that the geometry of water does represent a form resonance that is universally resonant. This structure being universally resonant, has structures within structures within structures, in other words these structures are fractal like nested within the body of water. The higher degree of harmonious coherence, the greater the sub-harmonic resonant structures replicate almost to the degree theoretically to that of infinity. In the science of electromagnetic antenna resonance, it is found that antennas that are termed log periodic which display resonant elements that are self-similar, also known as fractal, are resonant universally across the electromagnetic spectrum to transmit and receive radio signals for example. This is consistent with what Dr. Vogel would say that these laws in physics are "akin" or have similar properties. Research has shown that all life forms are based on the fundamental geometry structuring whose corresponding mathematics extend fractally into infinity, such as the golden mean or Phi 1.618 and hexagonal structures of the sq. root of 3 or 1.732, replicating itself with geometry patterns within patterns into fractal infinity, which has a correlation that our sciences are just now beginning make to the connection between geometry and consciousness. researching the connection with consciousness and water. I would like to give credit to others on much of the text on this page that was taken from PRI transcripts, articles on the web, etc., supplementing this page about the work of Marcel. I would like to share from a personal perspective what I learned from Marcel while working and hanging out with him and that wonderful mind of his. The material that follows are partially taken from supportive lab experiment papers and other reference materials that have shown indicators that point to an understanding in this direction. I do not wish to infer that this understanding is by any means complete or fully accurate in it's total understanding, but rather an indicator toward a direction of understanding a newfound science of the future. This understanding appears more mystical than traditional science, but in essence, science in it's depth of understanding is truly mystical. I can say that I have never met a scientist like Marcel that could bring that which is mystical into a scientific framework of understanding as he could. Essentially we are creative beings that create and recreate from moment to moment our reality and oscillate at our own unique frequency. This oscillation that we resonate is derived from what some term as our "soul" (but isn't everything semantics until the scientific language can support a fuller understanding). We operate within an interconnected information matrix of consciousness, in which time and space are aspects of the structure but these are not limitations of the subtler realms or higher octaves of it's structure. The structure of this matrix is vibratory and therefore geometrical and multidimensional in it's harmonics. The geometrical lattice structure of material quartz can store, amplify and transmit through it's repetitive crystalline tetrahedral structure, that forms hexagonal in shape and at a 52 degree golden mean angle which appears to align with the underlying mathematical structure of this matrix and therefore appears to act as a conduit for the creative patterns of thought through it unimpeded. Being a broadcast engineer, I would like to give a perspective on the amplification of thought through the crystals lattice structure. Marcel used to say that the known laws of science and properties which we can measure were "akin" to those which we were working with in the mind/matter research with the crystals. In radio theory, a single antenna has a definite gain. Duplicating this antenna and feed from the same source will provide 3dB more gain. Duplicating again will add 3dB more. etc. 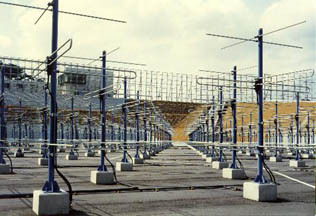 Antennas arranged in a configuration called a "Phased Array" appear very similar to that of a repetitive crystalline structure. 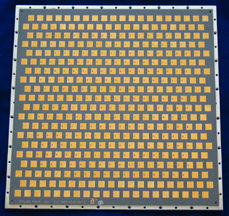 Enormous gain is realized by feeding this large array of little repetitive identical antennas such that they are in phase with each other by feeding the signal and spacing the distance of them apart for the correct wavelength or phase relationship. 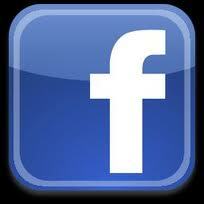 So that the overall effect has greatly amplified the signal of receiving or transmitting. You could say that, all of the little antennas resonating on the same wavelength are equivalent to a large powerful high gain antenna, whose signal strength can break through the background noise and override weaker signals. Another analogy is that a thought pattern, akin to a radio signal, which is induced into the repetitive crystalline array, is rebroadcasted in a coherent or in-phase with itself relationship, so that the accumulative effect is to amplify the original thought pattern from the individuals mind. This pattern is now being joined by trillions of other programmable minds, you could say, in complete unison or coherency of the originating thought that was induced into the crystalline matrix. Imagine as though you are a magician and you have at your command trillions of unpatterned minds that will say yes to whatever you think by reflecting and patterning your thoughts. It is like many Buddhist monks chanting and praying in unison toward a single vision of thought and therefore through the power of numbers, it becomes more powerful. The similar atomic geometries in water, although not patterned in a crystalline formation when liquid, have a similar ability to interact with thought. The transference of these thought patterns, it has been found, can occur from quartz that is attuned to cohere the unique vibratory resonance of the user, and the users intention can be programmed into the crystal and transferred into water by circulating the water in a clockwise direction around the quartz crystal. This process is akin to how an inductor in electronics induces an energy field into another component in proximity to the field. Since all matter records these energetic patterns, with some having greater permeability than others, such as stones and metals can store greater than wood and plastic for example. These recorded patterns oscillate on multiple harmonics, in other words from ethereal (mind stuff) to more denser (physical matter) and thus subtle patterns can manifest into a physical pattern. Since patterns can be stored in matter and nothing is dormant in the vibratory universe, they can be continually rebroadcasting that pattern and therefore have a tendency to perpetuate or re-create itself, so long as nothing intervenes with the pattern, such as erasing it or repatterning it. I bring this point up in regards to patterns that become locked in a persons body, for example, whether it be created from a mental, emotional or physical impact level. In the physical sciences, the ability of crystals to store information is widely known. "According to the September 4, 1994, issue of Newsweek, Stanford University physicists have demonstrated the first fully digital model of a device that stores information as a hologram within the subatomic structure of a crystal. The scientists were able to store and retrieve a holographic image of the Mona Lisa. The particular crystal held only 163 kilobytes of memory, but it is expected that these holographic units could store up to one million megabytes. The short article says that crystals store information in three dimensions and could be ten times faster than the fastest systems currently available." Whatever thought pattern occurs within us, we have a tendency of recreating, unless intervened upon by our creative ability. The underlying matrix in which forms our physical forms is patterned by our thoughts. As we inhale and exhale our breath, there is a multidimensional information exchange in this breathing process occurring of the sending and receiving of our thoughts. This thought-breath link has characteristics that show that a rapid transition or a rapid short burst of breath can cause a rapid transformation in physical matter focused through thought. This could be analogous with that of striking a bell sharply versus softly or creating a ripple in the ocean versus the sharp earth movement that can trigger the power of a tsunami in movement. In electronics a sharp spike in an electrical signal will generate a lot of power in harmonic multiples of the signal. Such is the effect with the breath and focused thought. In order to focus and amplify this thought and intent utilizing the properties of quartz, Marcel received a vision how the quartz crystal could geometrically be formed to act as a cohering device that could receive from one end (the universal or female end) and project the users resonant field. This frequency of the individual, translates, as all frequency patterns do, to a specific geometry or angle. This is what forms the other end (the male end). The crystal would then act as a transducer of thought and reflect upon itself within the crystal in a cohering fashion that would amplify the thought and intention of the user. 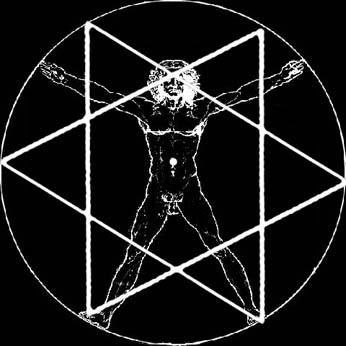 This design originally inspired by a vision of the form of the Kabbalistic tree of life, whereas the upper triangle is symbolic of creation from the highest unmanifested level which Marcel selected appropriately the 52 degree angle at one end which is placed along the growth axis to the other end. This is the plane in which energy spirals through the crystal, this can be seen as revealed as left or right handed terminations to which direction the spiral is moving into a pyramidal hexagonal point of 52 degrees which is the angle that the natural 6 facets of quartz terminates. This is the exact angle of the Great Pyramid and contains the ratio of the golden mean which is reflected throughout life's patterns and is the only ratio that goes into perfect portion into infinity, thus reflecting the very nature of creation. The other end symbolic of the Tree of Life's lower triangle, representing the final earthly manifestation, is also pyramidal in form but instead of 52 degrees is formed with a more acute degree angle of around 60 degrees that is resonant with the individual. The completed crystal with its universal resonator at one end and the personally tuned resonator at the other end then work to cohere the thought and intension of the user that could be analogous with that of how a laser works. For example in a laser a ruby crystal is situated in an enclosed tube between two mirrors. Once the ruby crystal has been excited by photons it projects its energy to the mirrors, which both reflect back and forth in a resonant manner that amplifies the light energy manyfold through this reflecting process. Since one mirror is 100% reflective and the other 99% reflective 1% of the energy fires off one end and creates the beam of cohered laser light. In a process "akin" to this, thought that can be cohered between the two faceted angles in the quartz crystal. 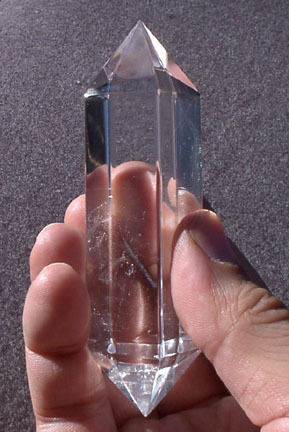 This is the fundamental shape of the Vogel quantum transducer formed out of quartz crystal. 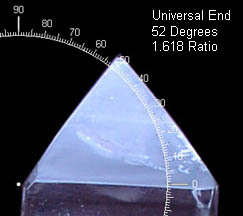 Note that the female or universal end is always set at exactly 52 degrees which is the natural interlattice angle of quartz and is associated with Phi (1.618). The male or firing tip is critically formed to reflect the imprinted patterns of thought in such as way that the more acute angle projects the energy akin to how a laser outputs a coherent beam. 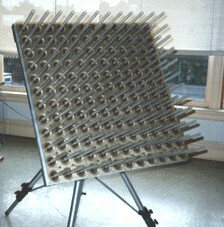 The number of sides on the Vogel crystal determines the frequency of the vortexial spin eminating in its output. Coherent thought is powerful because it, similar to the laser, builds upon itself and therefore comes closer to full manifestation from thought into the physical realm. Just as the laser excitation medium such as a ruby crystal or helium-neon gas resonates at a precise coherent frequency, the quartz crystal is attuned radionically to 454 the rate of water. Quartz like water both being a universal resonator, resonates to all structures and is therefore unimpeded in what it can cohere and transmit in the spectrum unlike a single frequency laser. Under the concept that thoughts are things at a pre-physical or virtual level of existence, when cohered, can actually take physical form in a time scale proportional to the degree of coherency of that thought. This could be liken to how an Eastern Master can materialize an apple or object in his hand through a completely clear visualization of it. An example of how the mind projects energitic patterns that affect a sensitive crystallization process was demonstrated by Marcel while he was viewing the growth of a liquid crystal, Marcel was able to alter its final form. Instead of maintaining the normal shape that an oleate of cholesterol would take, the outcome was a configuration clearly recognizable as the Madonna. Marcel had been focusing on an image of the Blessed Virgin in his mind’s eye while viewing the growth of the crystal under the microscope, uninterrupted, for one solid hour! In the techniques that Marcel shared with me in erasing and repatterning discordant or dis-eased patterns in the body it was noted that injuries that were physically impacted to the skeletal structure of the body, responded most rapidly. It was noted that the bone structure had an ability to store and record these patterns more readily. These patterns are especially recorded in water, in which the body is 70% composed of. In the process of knowing where locally to work on the body, if not readily apparent like a broken arm as such, oh I better get this out of the way and say "These statements have not been approved by the FDA and before trying any of the procedures here you should see your doctor first". yeah right, Ok back to our discussion in locating the causal source of a problem in the body. Not to get biblical (because I am certainly not into any religion) but the statement "ask and you shall receive", has some fundamental truth to how the information matrix of the mind works. There is truth in the saying that sometimes truth is so simple it evades the mind, which is looking for complex answers. The mind is such that, you put a question pattern out and then without questioning your ability to receive the answer, allow the mind to show you in whatever manner it may want to take in your mind's eye, be it an image, a pattern, a color or emotion. Use this information as a focal point to process that which is at the root cause of the problem in which you asked to be shown the causal pattern of. 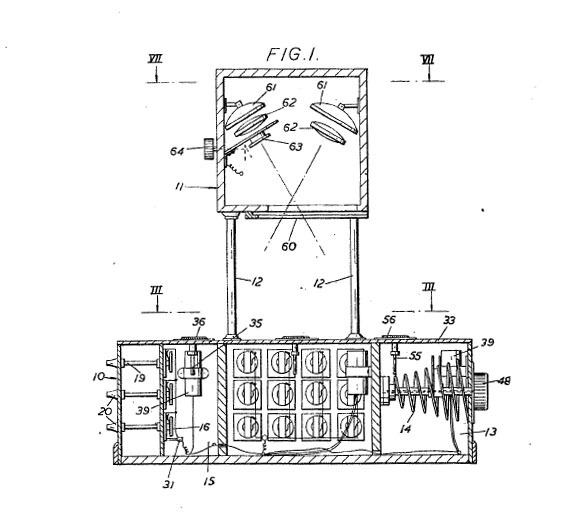 The process of intervening with a crystal instrument such as this with an individual who wishes to release a discordant pattern in their body has been laid out fairly well in detail by others who worked with Marcel as well. Such as in the bottom section of this PDF document. I will briefly summarize the process I was instructed and have used successfully. Note there is no substitute for experience with this, and there is more details to all this, but this is only meant as an overview of the procedure. I learned directly from Marcel and watched and learned as he did this process numerous times. 1 Consent to Facilitate: First of course you must have the persons consent and willingness to process and allow you to act as a facilitator of that process. Acknowledging that they essentially will be doing the process of bringing balance back to their body and that your role will be assisting them. 2 Energy Level Up: You and the person need to have your energy levels up. You can't do much if either of you is not at some level of charge. This is done through the breath and breathing deeply in sync. 3 Resonate and Link: Once your charge is built up in the crystal through rotating and rubbing it in your hand, this builds up an electrostatic charge, it is then brought into resonance with the person by slowly turning the crystal clockwise until a resonant peak is felt in your receiver hand. 4 Ask to be shown the Source: Once you are linked into their system, have them ask to be shown in their minds eye the root cause or source of that which is causing them the problem. While they are doing that you are amplifying their energy in a clockwise spiral as thought to create a vortex of energy to come into the area to be processed. What I have personally experienced is it actually will increase the discordant signal level in their body, making it easier for them to lock their mind onto that which is causing them the problem. This could be analogous to an out of tune electronic circuit that you pump more power into it and the bad components start to heat up and reveal themselves. All the time this is going on they are breathing deeply in and out. 5 Lock on and Release: Once the person receives in their mind's eye the response to their question of the source of the problem, be it an image, pattern, color, emotion, or whatever etc., it's important to take what comes at face value and not analyze, but rather have them use it as the tool to lock their mind onto it, as they slowly take a deep breath in and at that exact point in the breath cycle, just before the exhale, have them completely connect to that which was given them as the source of the problem. Then in a powerful burst of exhalation, very similar to how a martial artist would release his breath in a Kung Fu blow, you give the command to "Release! ". Release with them in sync, visualizing that pattern going out of their system with the pulsed breath and assisting them with the crystal, energetically like a scalpel, removing the offending pattern from their system. 6 Restore with Love: Immediately upon the release have the person fill the void of what has been removed with "love for themselves" this is important because Love is the integrative force that brings things together in harmony. It may sound unscientific, but in fact, it is what works. You may want to also ground the person because after all that deep breathing you can get a bit out there. Marcel used to suggest touching along the back of the collar bone area for a grounding effect on the person. 7 Clearing the Crystal: Since the crystal does record all of the interactions of this exchange, which you would not want to transfer onto another, it can be cleared by using either a magnetic bulk demagnetizer (my fav method) or using the breath and pulsing with the intent to clear it and doing so on each of its vertical facets. 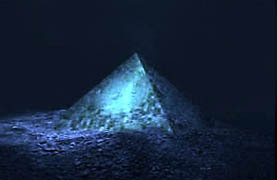 Dr. Ray Brown described the room in the pyramid which held the crystal in the center of the room with two hands atop a pedestal. From the pyramids ceiling a golden rod tipped with a red crystal pointed at the crystal from above. 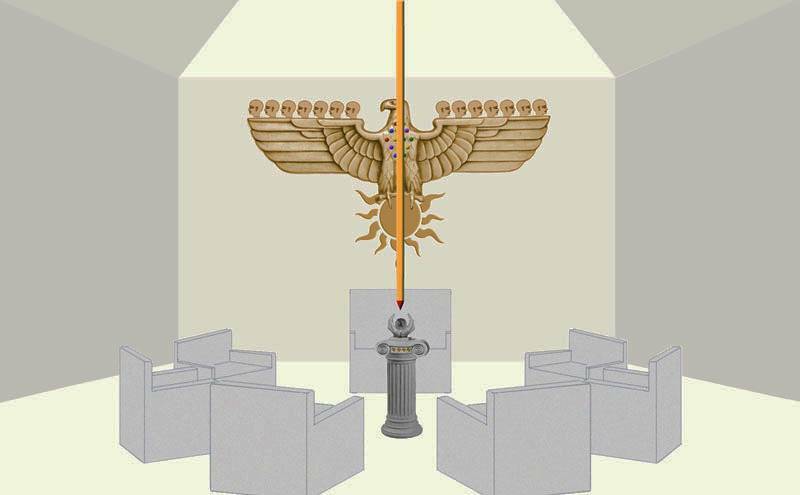 Surrounding the crystal in a circle were 7 chairs with one being higher than the other 6. On the wall was a falcon holding the sun in it's talons with 7 beings sitting on top each wing. On it's breast were 14 gemstones in a 2-3-4-3-2 pattern. The seven chairs in a circle surrounding the quartz crystal sphere which connected within it a grid system of pyramids and appears to be a method of interfacing the 7 beings, with apparently one of them in the larger chair leading the group and projecting their consciousness through the crystal, interfacing up through the red pointed crystal connected at the end of the golden rod from the ceiling connected into the massive pyramid structure interfacing possibly whatever this groups intention was, possibly changing the actual structure of reality? who knows, but it's significant the element of consciousness interfacing with these advanced technologies in that pyramid room that incorporate a higher understanding of the geometry interface between mind and matter. A lost knowledge from our ancient past. "Love is the glue of the universe and helps keep matter in form. When I love you, I empower you to bring yourself into a state of wholeness." "Our primary responsibility is to love." For Marcel, May the force of Love be with you always!